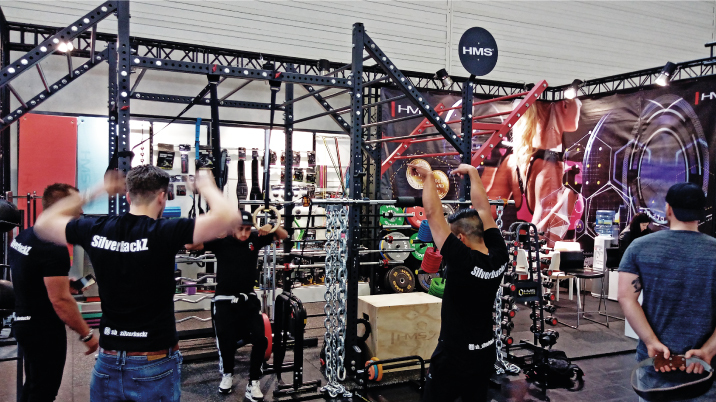 As every year, the FIBO trade fair increases the number of visitors. This time the number of guests exceeded 140,000 with 1,100 exhibitors from 49 countries. HMS was the only exhibitor from Poland. 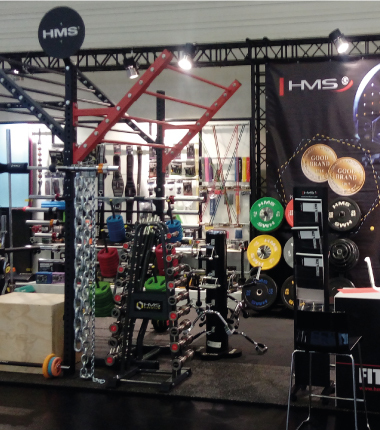 HMS Fitness presented two types of solutions this year: comprehensive solutions for commercial fitness, home fitness products including many technical novelties. 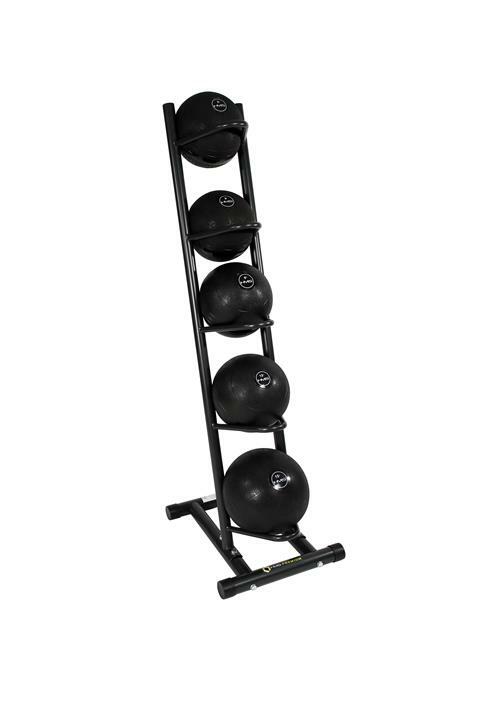 The group for home sports enthusiasts features among others such novelties as dumbbells with precise load scaling option – having detachable weights and a small weight stroke from the SR series. 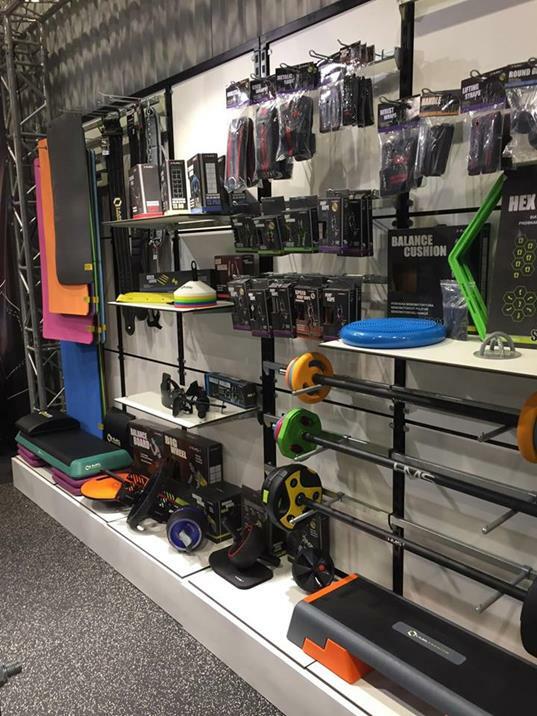 Among numerous products we presented it is worth listing bumpers and kettlebells presented with new designs, as well as training bands arranged in new, functional sets. 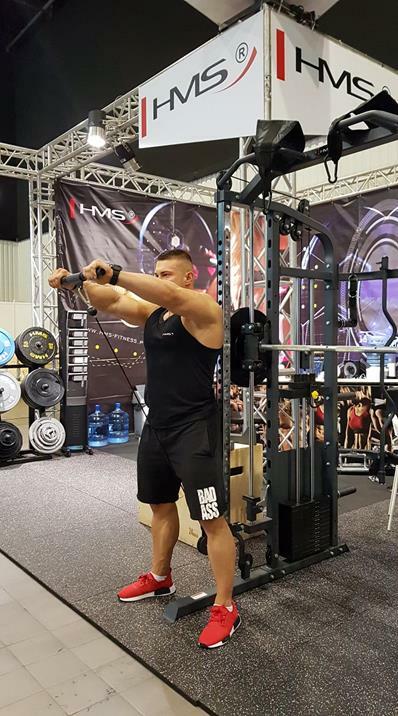 The HH HMS Premium series of dumbbells with a stainless, satin finishing and rubber rings increasing the comfort of use made a big impression. Likewise, load chains for squats were highly attractive judging by the queues. We were the only company at the fair to offer this product! 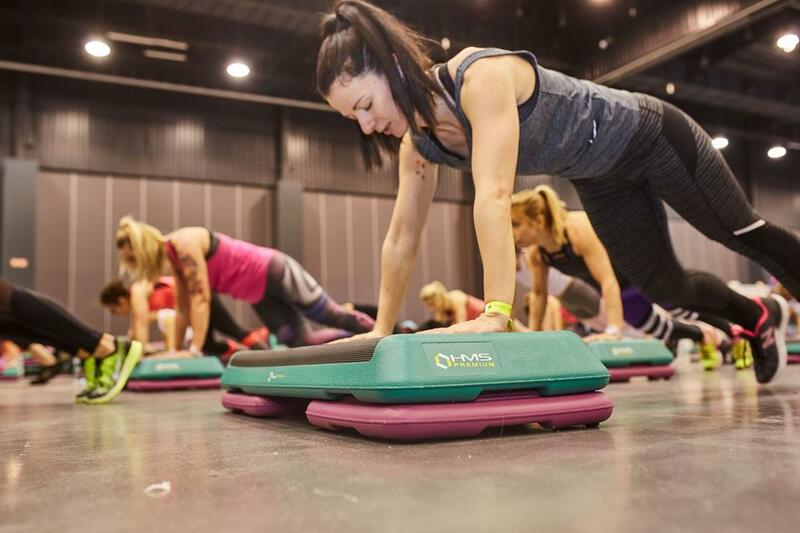 Commercial fitness range was based on the combination of products into functional paths offering comprehensive training experience for the client and support for coaches in their daily work. 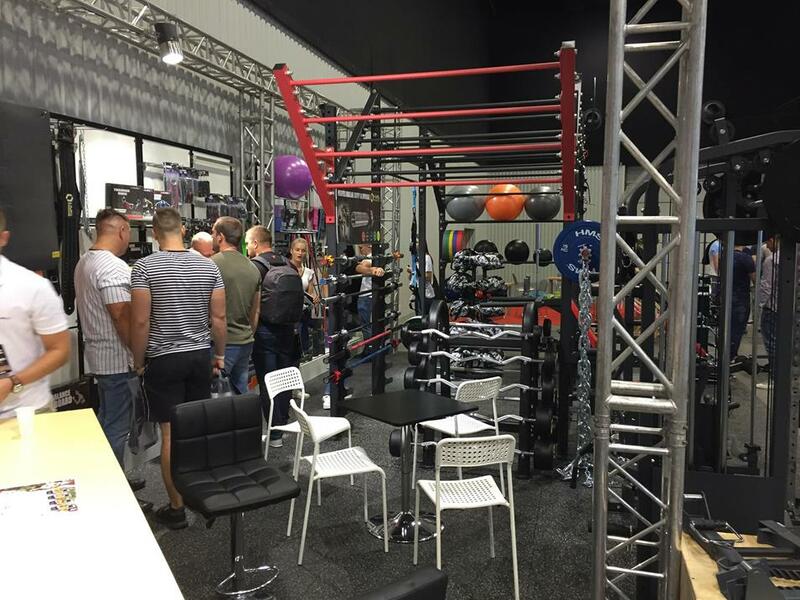 At the stand, we most often talk to managers of large fitness networks from Western Europe – mainly from Germany, Italy, the Netherlands, Spain, and France. 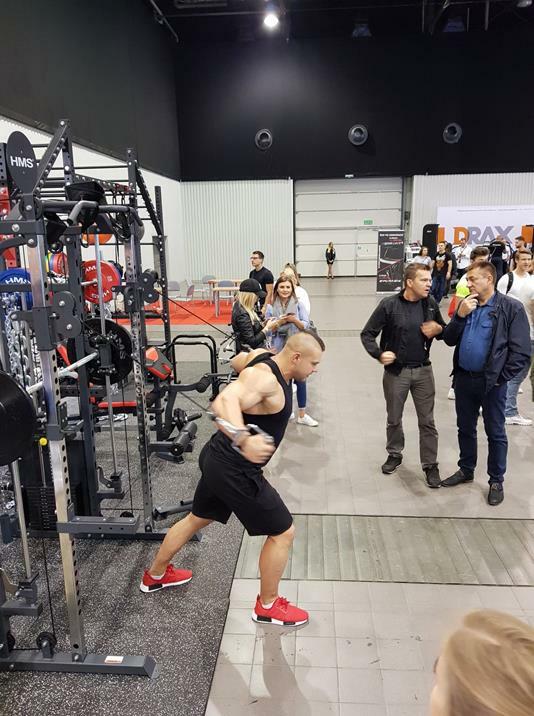 Although this year the number of visitors from Poland at out stand was slightly lower than last year (about 700 people) we did not complain about the lack of compatriots: we had the pleasure to talk not only to the managers of large gym chains in Poland but also to the representatives of smaller elite clubs. On the one hand, business meetings let us boast of our products. 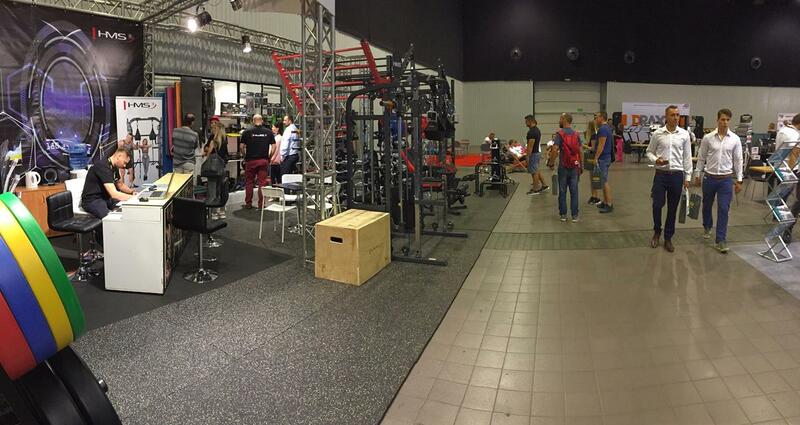 On the other hand, conversations with enthusiasts, personal trainers, instructors inspire us to develop new projects. 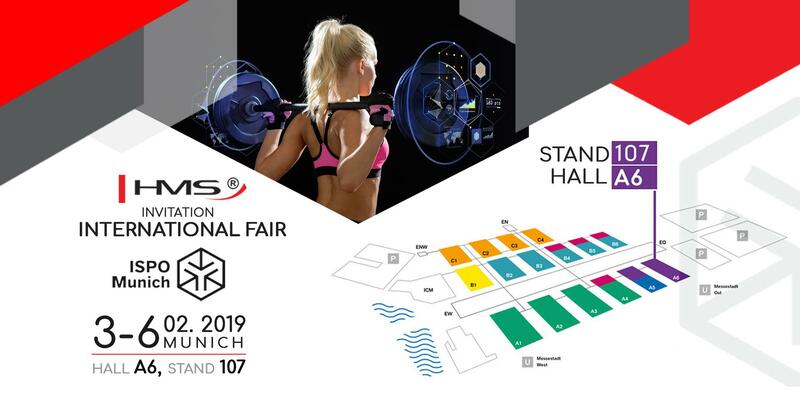 We warmly invite you to the Fibo Trade Fair. Everyone who is interested in sport and fitness is more than welcome. Visitors will be able to take part in interesting presentations, workshops, and lectures, and a newly prepared offer of HMS will be waiting for you at our stand! No one can miss out on it! Due to a change in the Google Maps policy, some of the features of the applications using Google maps’ technology have been changed or restricted. One of the functions that have currently been disabled is the so-called Google Street View; a virtual tour view is currently not available for the above applications. Since the software producer wants to provide the end customer with the best possible experience, it attempts to improve the “walk around the map” in a new application iConsole + training. 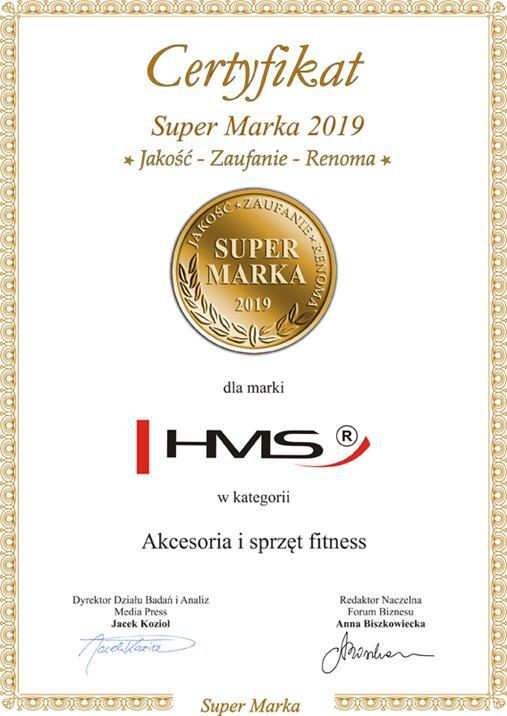 We are extremely honoured to inform you that HMS won the title SUPER BRAND 2018/2019 – Quality, Trust, Reputability in the category: Fitness Accessories and Equipment. 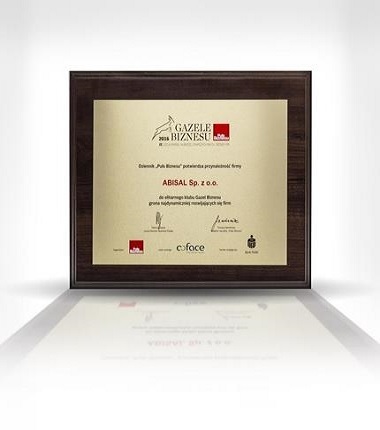 This distinction is awarded to the fastest developing and most recognisable brands with a high market position. 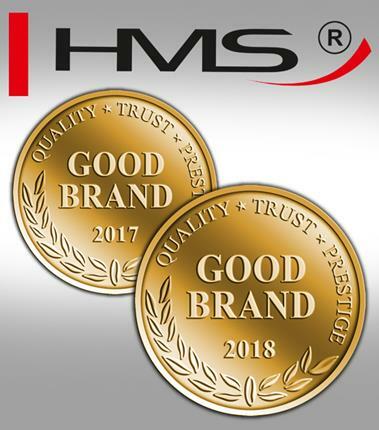 The quality of products or services presented by the companies and the level of consumer trust is also very important, which is why we are very happy that the HMS brand has joined the group of the best. 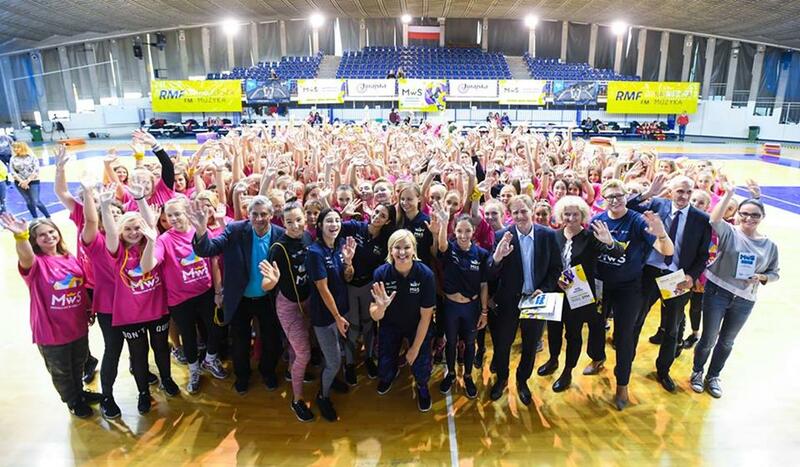 On 23–24 February 2019, the Healthy Lifestyle Fair ESP Sport & Health was held in Gdańsk. The exercises conducted in the mental zone also relied on our equipment. 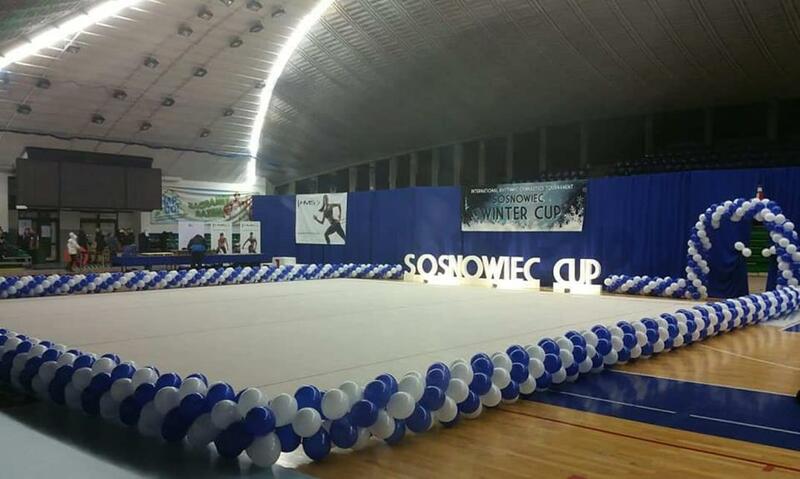 On 8-10 February 2019, Sosnowiec hosted the International Competition in Artistic Gymnastics Winter Cup 2019. 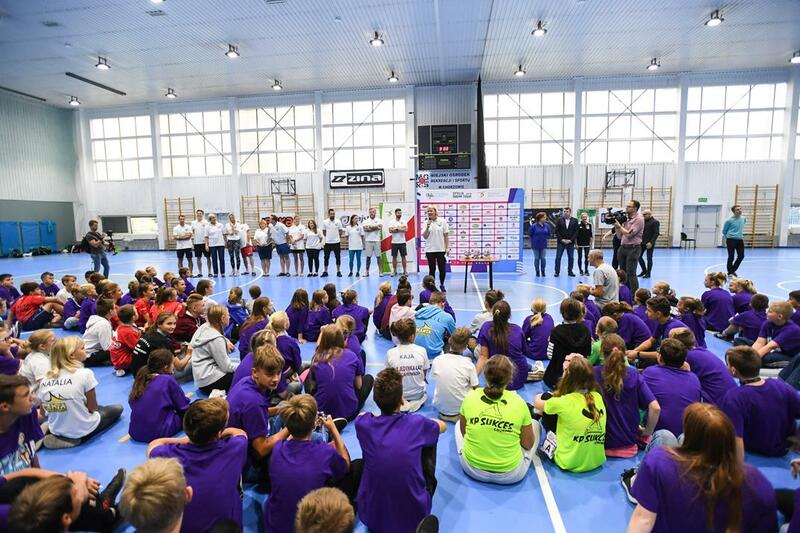 Over 450 female athletes from different parts of the world took part in it. 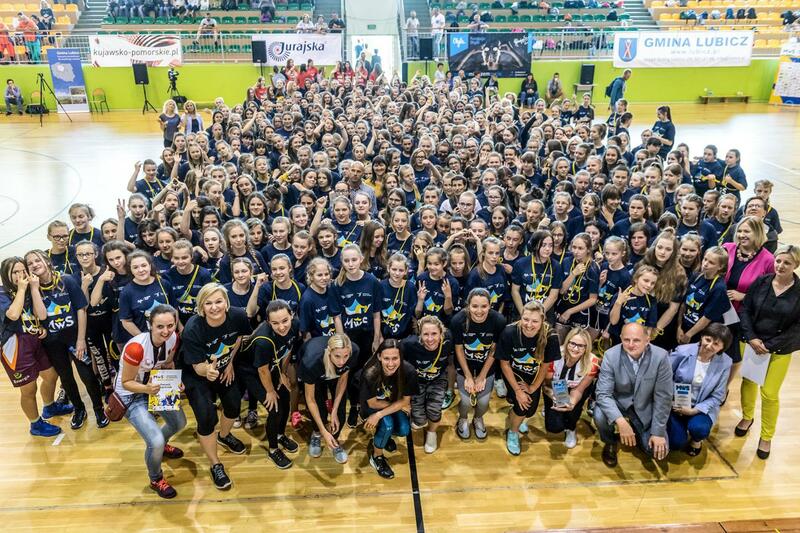 So far, it was the largest friendly tournament in artistic gymnastics in Poland. 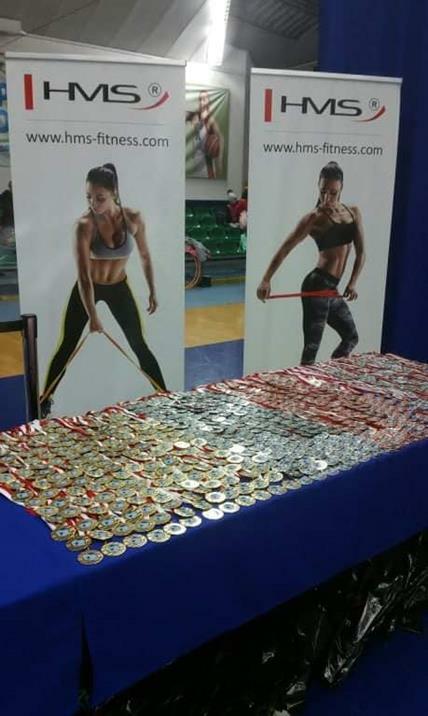 The HMS brand had the pleasure to participate in the organisation of this event and funded the mats and prizes for female competitors. 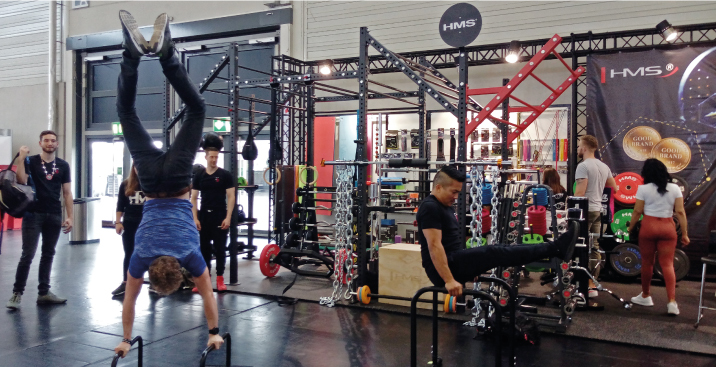 We presented our products at the greatest industry fairs – ISPO in Munich. The most important players in sport industry met there. Therefore, the representatives of HMS could not be missing either. This year, the fair was visited by nearly 80 thousand people from 120 countries around the world. The number of exhibitors amounted to 2943, which is 5% more than in the previous year. 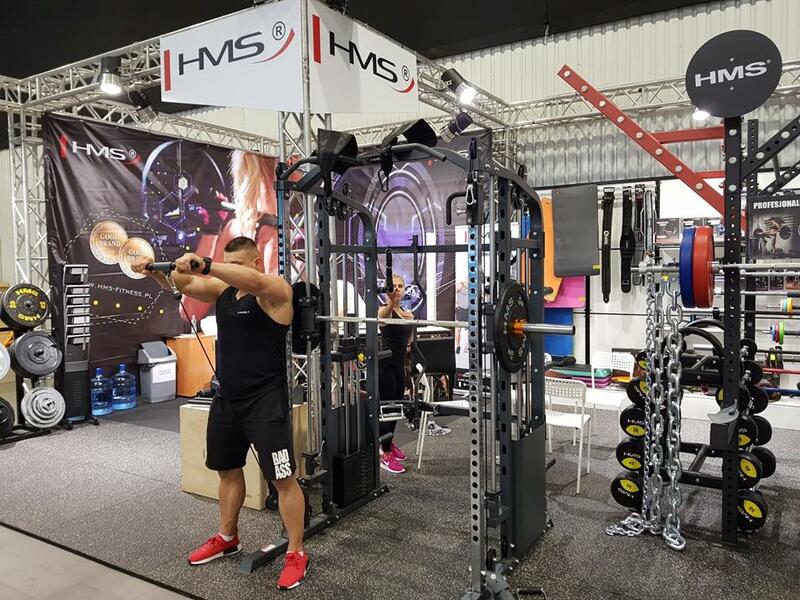 At the HMS stand, you could find equipment for aerobic training such as treadmills, elliptical machines or bicycles, as well as exercise accessories: training bands, rollers or skipping ropes. 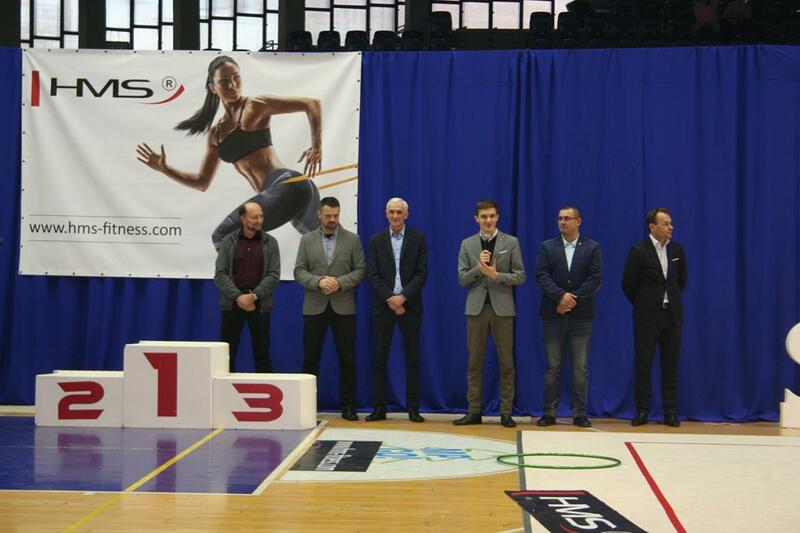 There was also space for presentation of two new brands: SKY WALK and SKY VIBRATION PLATE. You could test the latest vibration platforms as well as super-compact treadmills. We would like to thank the visitors for their presence. We can also assure you that we will meet again next year in Munich. 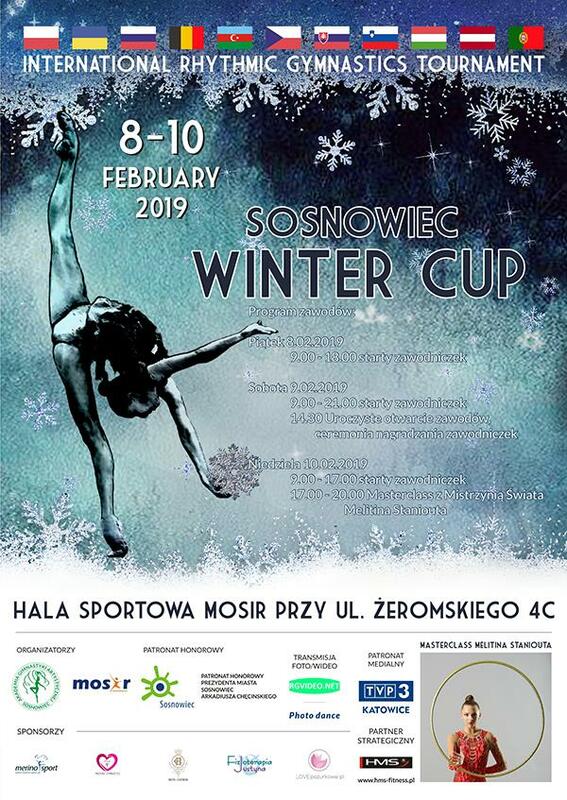 From 8 to 10 February 2019, in the Polish city of Sosnowiec will takie place International Rhythmic Gymnastics Tourbament WINTER CUP 2018. 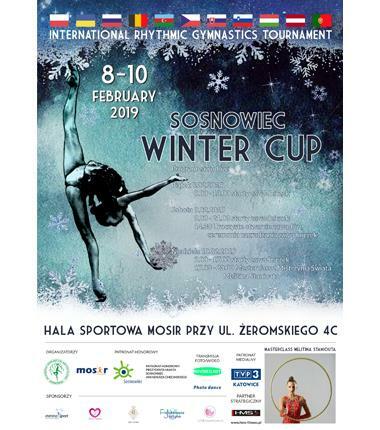 During the competition special training session will be hosted by Mlitina Staniouta, multiple medalist at the World and European Championships. We cordially invite you to take part in this event, where we are pleased to be a sponsor. 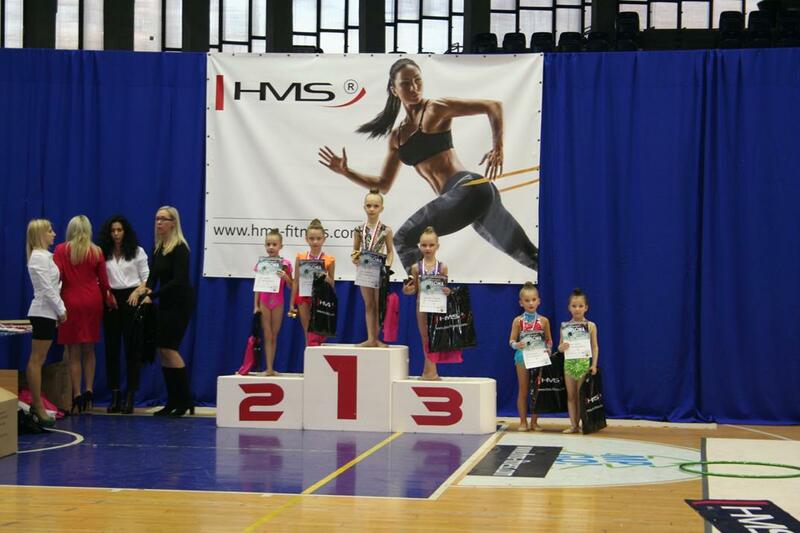 As a strategic partner, the HMS branc provides gymnastic mats and awards for partcipants. 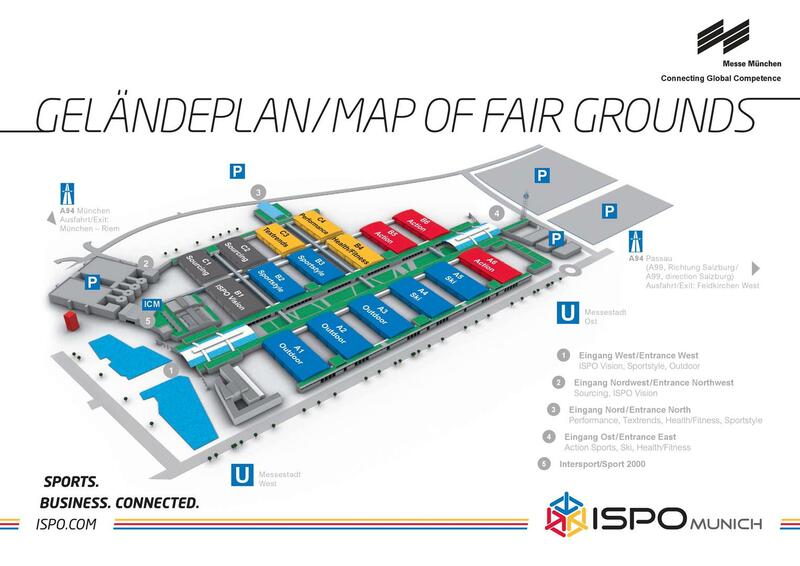 In February, from 3 to 6th of February to be exact, ISPO sport fair will be held in Munich. This is the biggest event of this type in the world. The greatest players and the most important industry experts will meet on this occasion. The whole world of sport will be gathered in one place. More than 2 800 exhibitors will present their products, the latest collections and innovations. 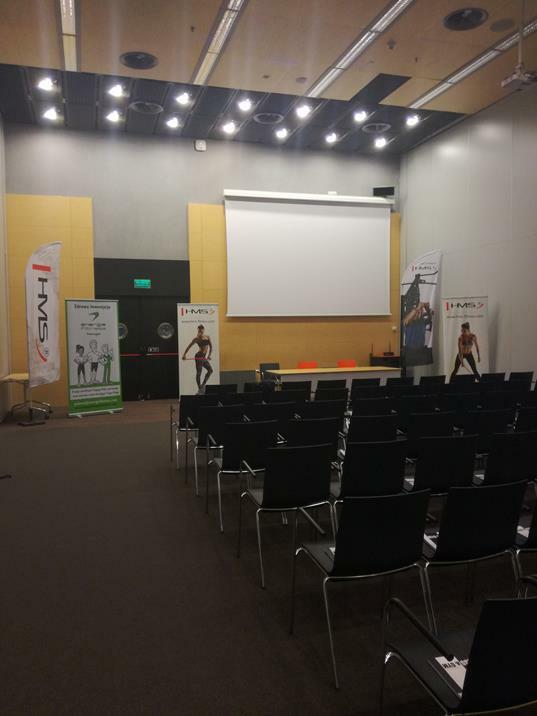 Sports and rehabilitation equipment, sports clothing, dietary supplements and many other products will be presented. HMS brand could not be missing among the many distinguished guests and exhibitors. It will present its products in Hall A6. Innovative equipment with air and water resistance is just a drop in the ocean of what you can see at booth 107. Apart from the latest products with HMS logo, you will be also able to see the SKY WALK and SKY VIBRATION PLATE brand equipment. State-of-the-art treadmills: intuitive, quiet, small-size. Vibration platforms with three engines that move the platform on three planes at the same time. This cannot be described – you must see it for yourself. Feel invited! You have at your disposal a wide range of resilient, steel stands for various type of equipment. Their sturdy structure and high quality of manufacture ensure safety of users and the equipment. 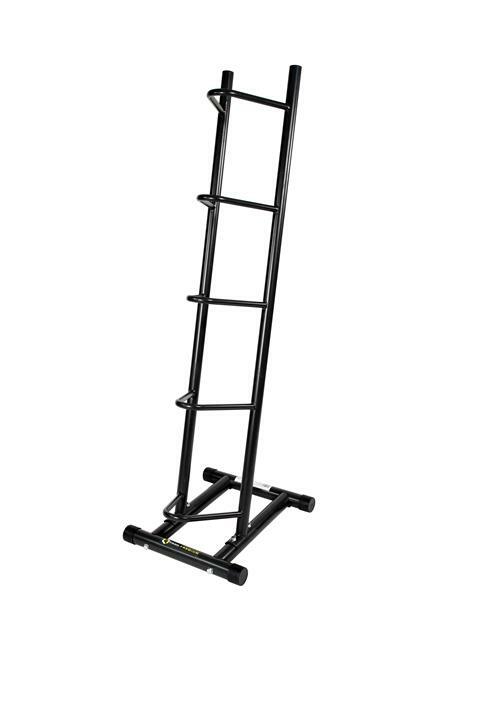 High stands are designed to make putting down and picking up of equipment easy and intuitive. The stand for equipment is an essential component of our home gym. We invite you to study our offer. 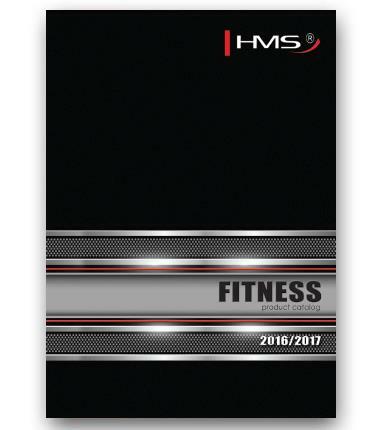 HMS has the honour to present to you a new fitness catalogue for season 2018/2019. 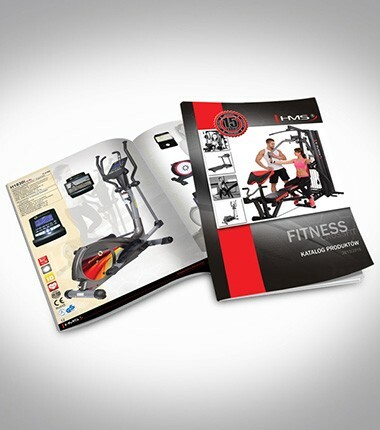 The catalogue’s objective is to present to you our product offer and encourage you to various types of physical activity. The range of products which appeared in the catalogue last year has been extended by a number of novelties. 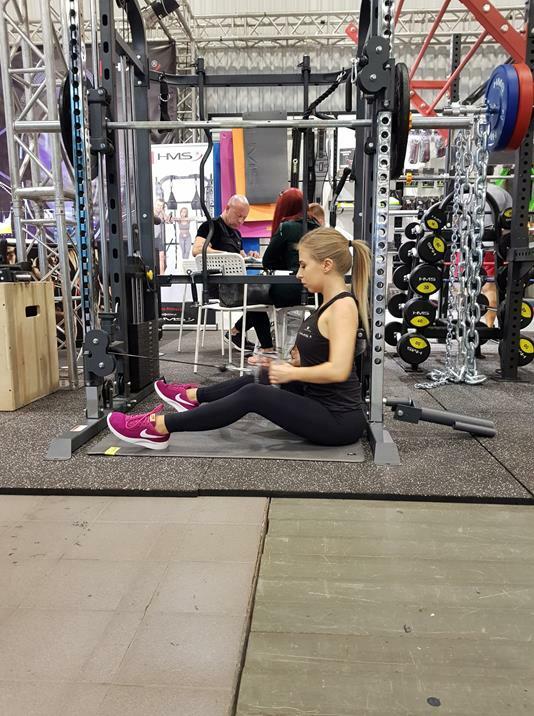 From new Smith Press Machines, two crossfit bars, through coordination ladders, to fitness mats. The catalogue has assumed a totally new form: its horizontal layout, much greater number of pages and white backdrop make it more readable. It attracts us with its interesting graphic design and excellent photos. The offer is addressed not only to fitness clubs and professional athletes but it is also a proposal for persons who are only starting their adventure with sport. From the beginning, our mission was to create high quality products to provide their users with unique experiences. We have remained faithful to it, focusing not only on manufacture quality but also on innovative nature of applied technologies. We warmly invite you to study our offer. 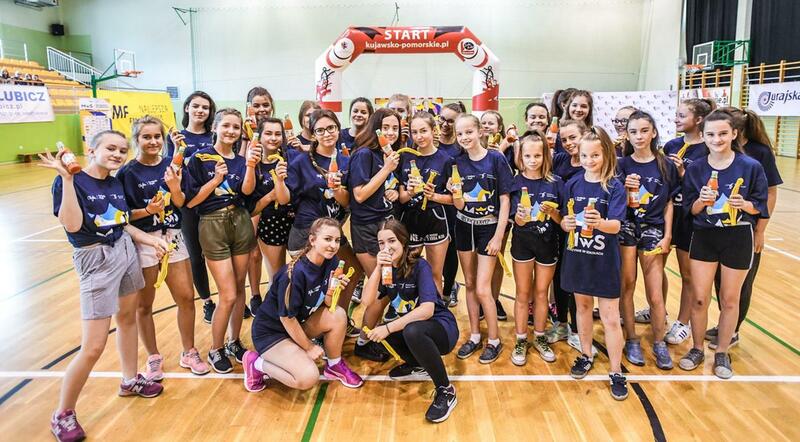 “Female Champions in Schools” is an author’s own project of Otylia Jędrzejczak, which is implemented by her foundation. 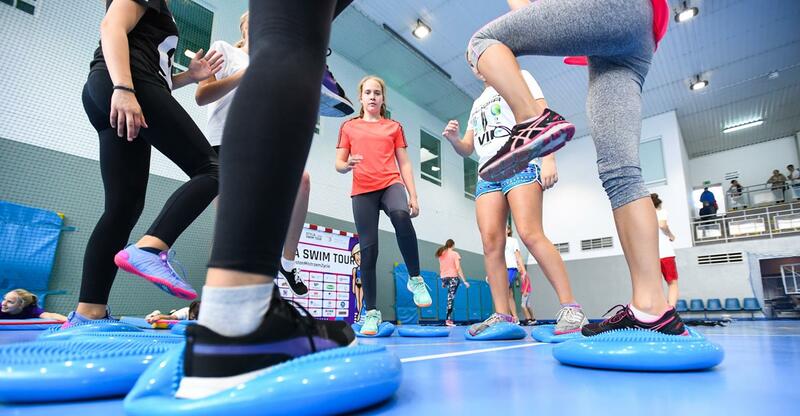 The objective of the action is to encourage girls from secondary schools to do more physical activity. 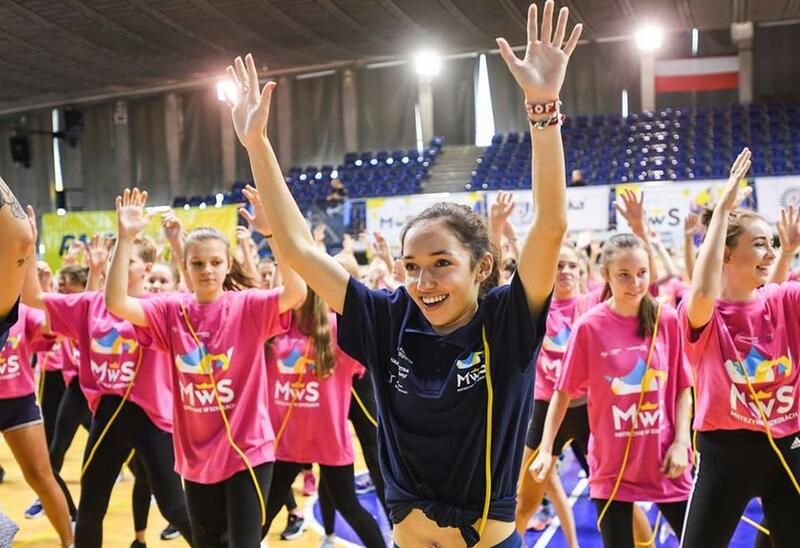 We promote active lifestyle and awareness of the importance of physical education classes, which are often undervalued, for girls of this age. 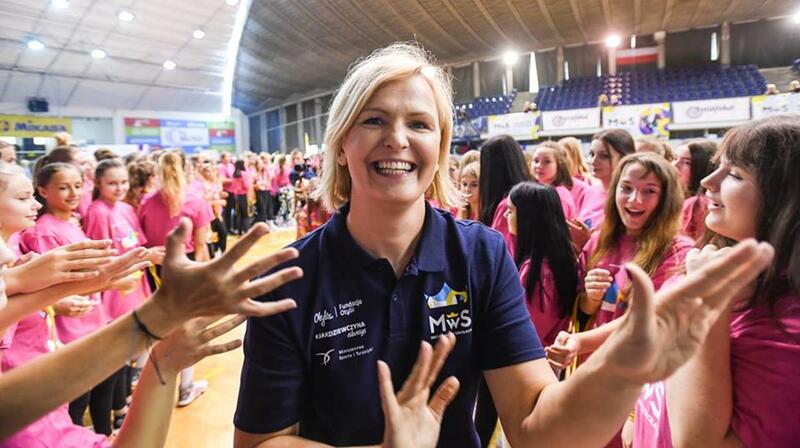 Otylia Jędrzejczak – Polish swimmer, butterfly and freestyle specialist, Olympic Champion, two-time World Champion, five-time European Champion (long course), three-time world record holder. Three times she was chosen the Best Polish Athlete. Magdalena Pałasz – Polish ski jumper, member of the Polish junior national team. Member of UKS Sołtysianie Stare Bystre. The first Polish woman in history to score World Cup points and the first Polish female ski jumping champion (2014). Sofia Ennaoui – Polish track and field athlete, specialising in middle and long-distance running. A finalist of the Olympic Games in 2016 in Rio de Janeiro at the distance of 1500 metres and a silver medalist of the European Championships in 2018 at the same distance. Ewa Swoboda – Polish track and field athlete, specialising in sprints. Katarzyna Woźniak – Polish speed skater, silver and bronze medalist of the Olympic Games. Zofia Klepacka – Polish windsurfer, World Champion and two-times runner-up in the World Championships in Olympic category RS:X; bronze medalist of the 30th summer Olympics in London. 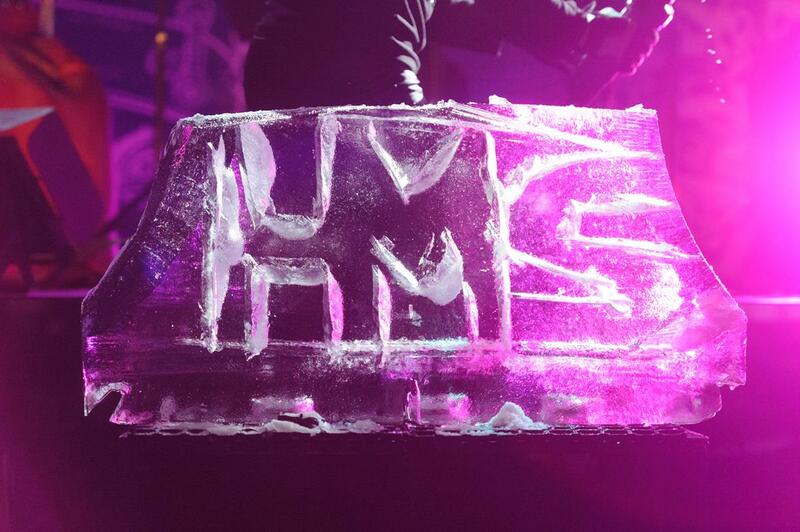 We are grateful that HMS could take part and be involved in such an important project. We would like to invite you to visit our gallery. HMS supports many young athletes. Thus, we are happy to be part of a prestigious project “Otylia Swim Tour”. 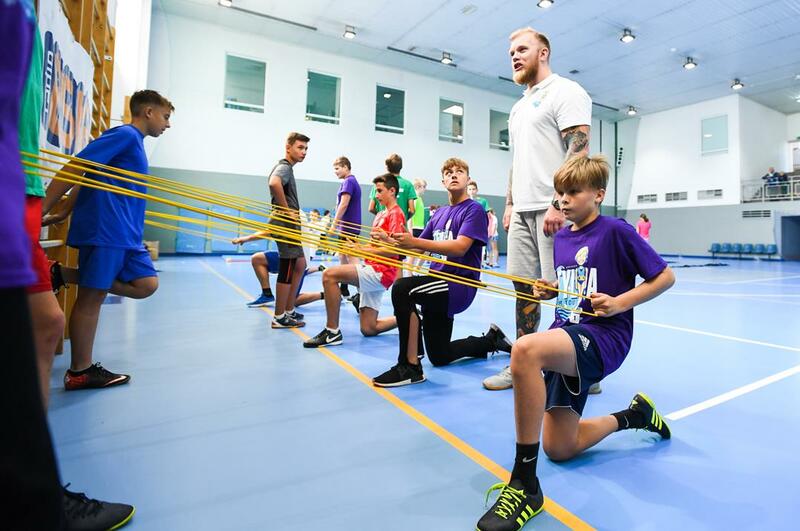 The project, which has been continued for several years now, enjoys growing popularity among young athletes year after year. Otylia Swim Tour is a series of one-day workshops organised in swimming clubs in the whole country. 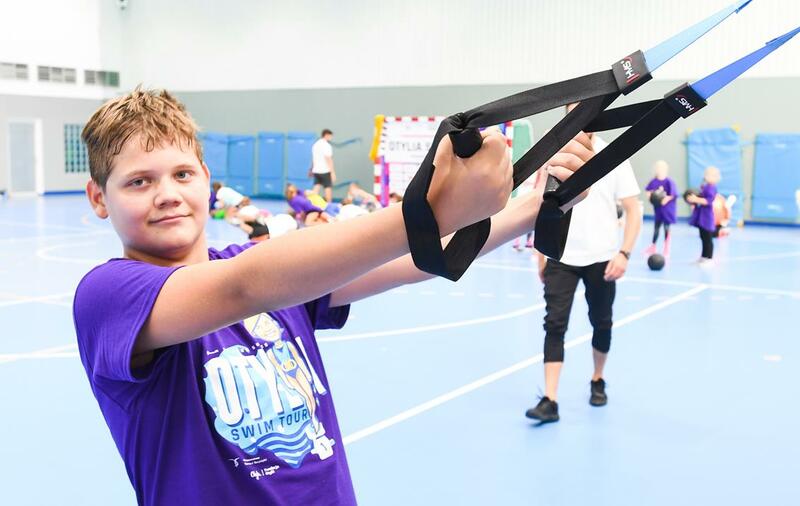 Each meeting is attended by 90 young athletes aged 10 – 14, who represent four swimming strokes (butterfly, backstroke, breaststroke, freestyle), their guardians and coaches. Separate classes are planned for each of these groups in order to provide them with knowledge of adequate profile. 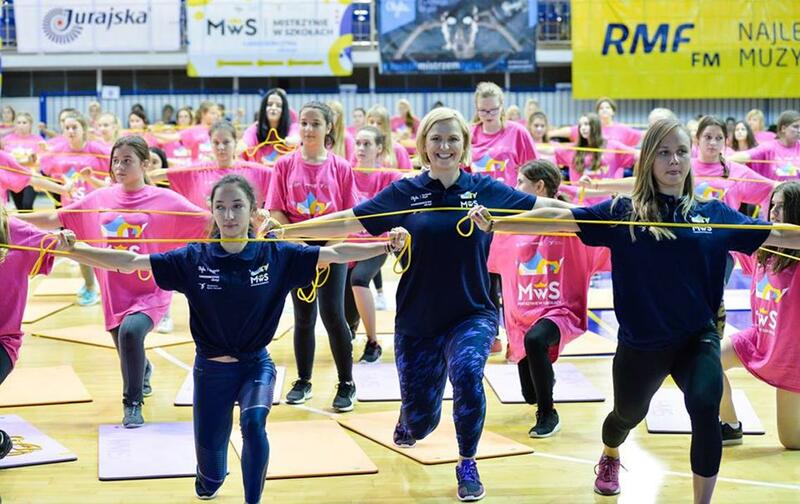 Otylia Jędrzejczak invited excellent coaches and experts in their specialties to the project, and HMS provided its sport equipment necessary for proper performance of training. 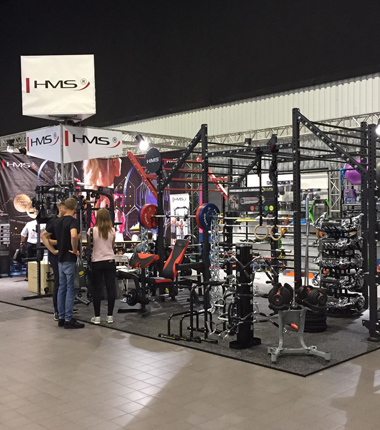 During the weekend, 21-23 of September, HMS was an exhibitor at the greatest and most industry-focused fitness trade fairs in Poland. 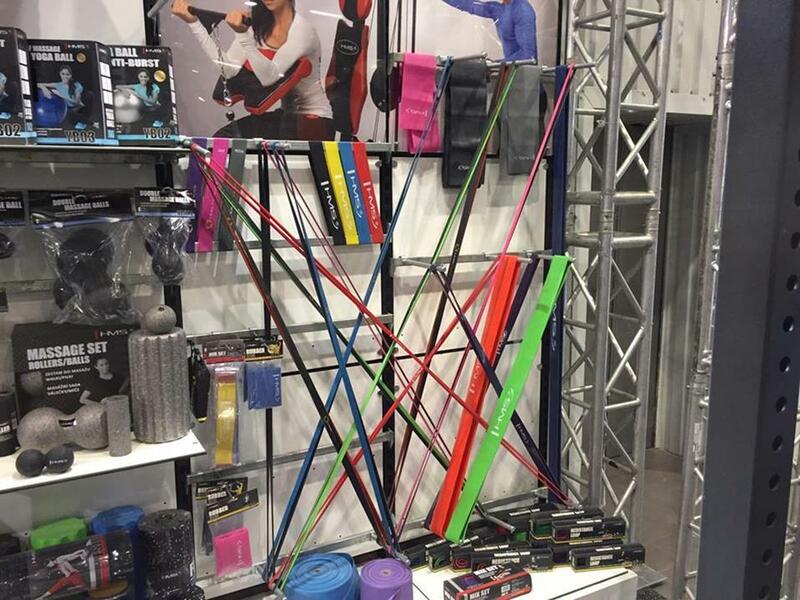 We are talking of course about FIWE – Fitness Trade Show. FIWE is currently the fastest developing industry event in this part of Europe. 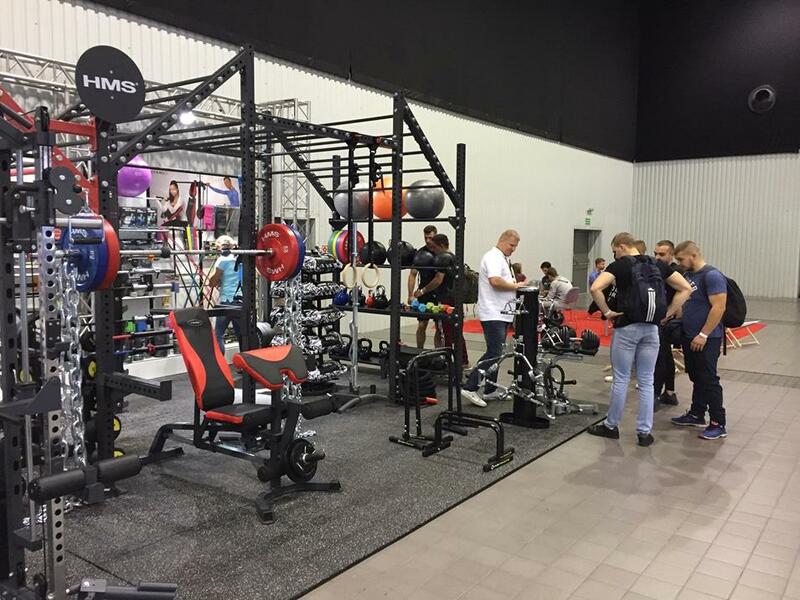 It is a largest meeting of fitness & wellness industry in Poland, intended to present a rich assortment of fitness & wellness equipment, accessories and services. 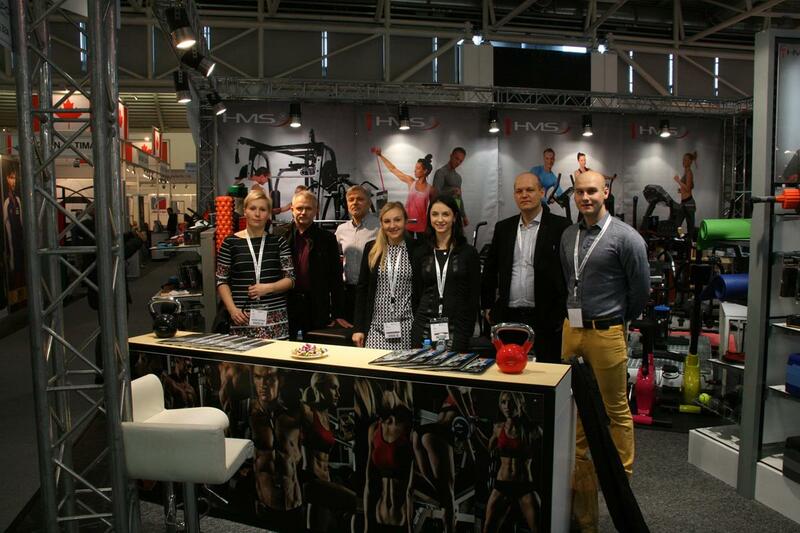 More than 200 exhibitors presented their offer of sport equipment, rehab devices, workout clothes and diet supplements. HMS had its stand among them. 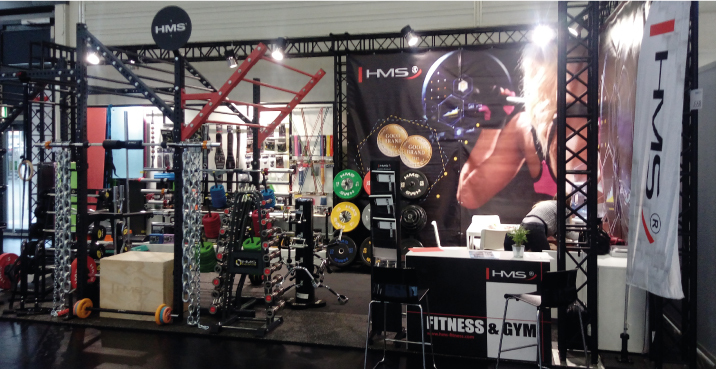 The stand displayed products intended for fitness clubs and gyms. 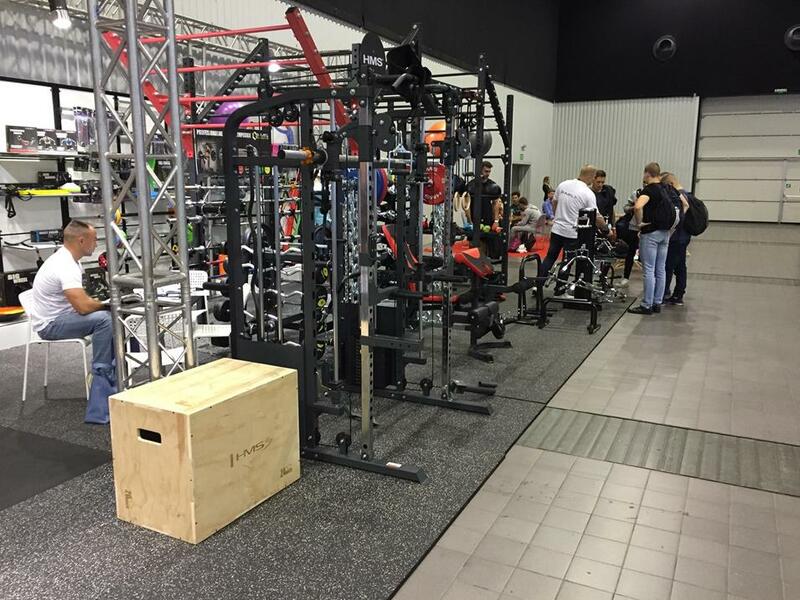 The quantity of exhibited equipment would be enough to furnish any fitness club. 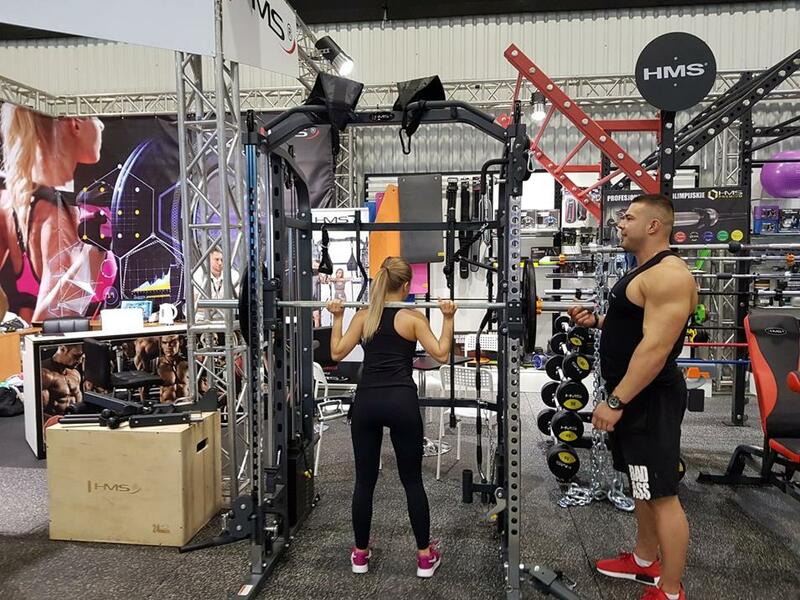 Moreover, on the second day of trade fairs, additional attraction of the stand was provided by a sport pair, Natalia Burda and Daniel Poniedziałek – Polish Junior Bodybuilding Champion in 2017. They presented their skills using Smith’s Press Machine CYKLOP 2. Turnout was great as always. More than 30 thousand people visited Expo XXI premises which hosted the event. All guests enjoyed themselves and felt full of positive energy on leaving the venue. This season, we collected current products from our offer and many novelties, creating a completely new range of goods – intended for commercial use! 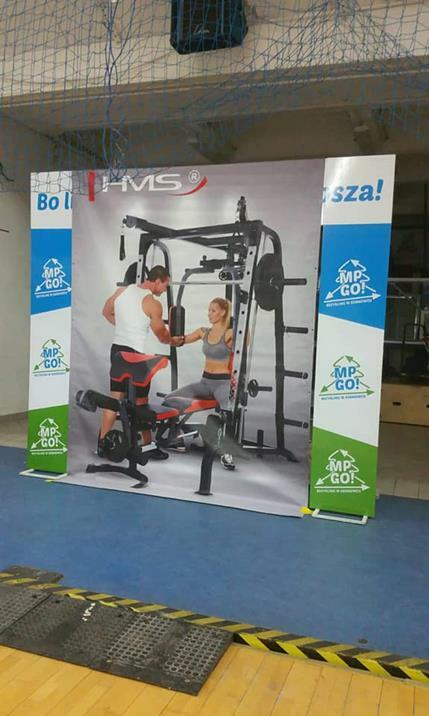 We extended our offer with mats which are a phenomenon of equipment of every fitness club. 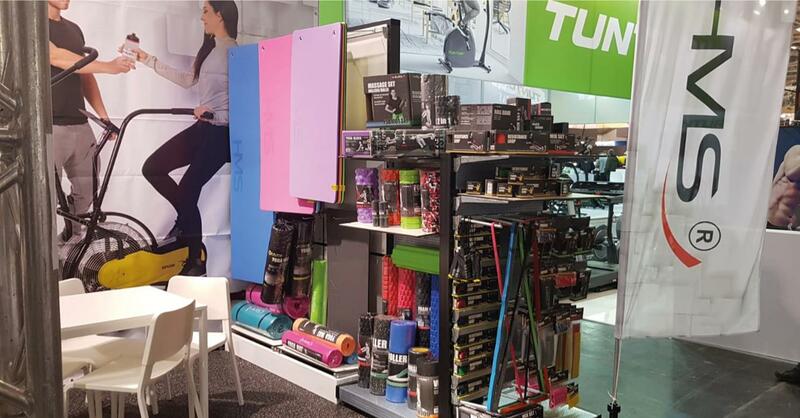 A wide range of rollers and bands completes each studio in sport clubs. 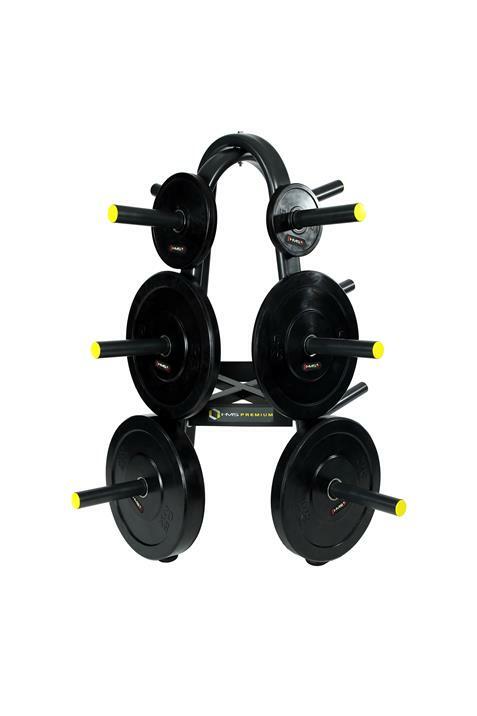 Products intended for crossfit workout are a complete novelty in our offer. 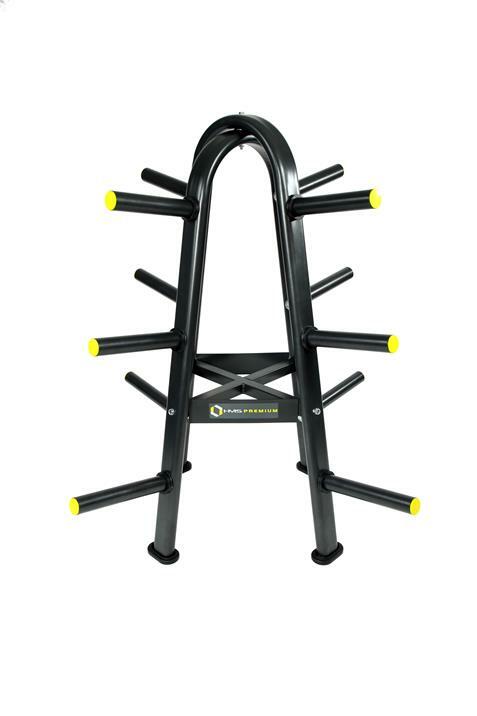 We are talking about, for example, training boxes, ropes, supports for push-ups or coordination ladders. We offer a wide selection of Olympic bars and crossfit bars of various lengths, diametres or maximum loading. 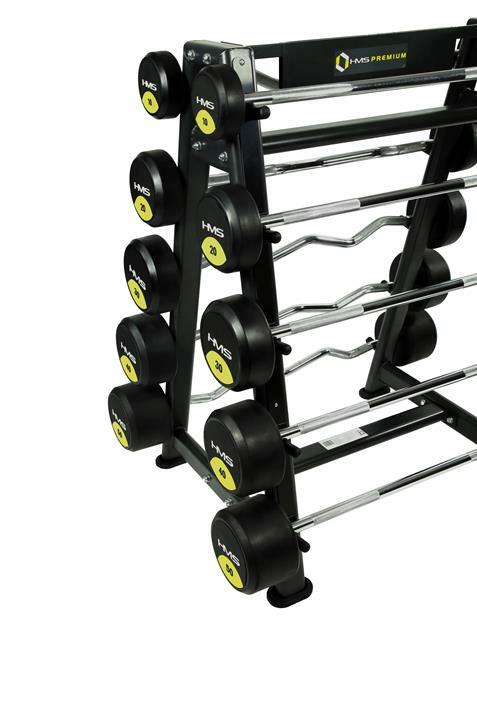 For the first time, our offer features stands for weights which are an obligatory element of fitness clubs’ furnishing. With pride and satisfaction, we would like to present to you our catalogue for season 2018/2019. Our current collection is very special. It includes the whole offer of products intended for fitness clubs. You will find in our catalogue the products which appeared in our offer last years but also a whole lot of totally new goods. 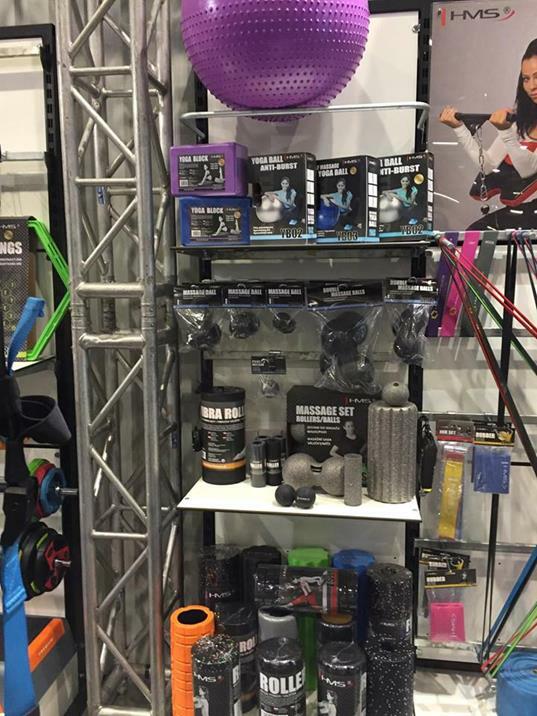 From club mats to a wide range of crossfit products. The catalogue has changed its form completely. It should be read horizontally and the white backdrop makes it very clear. We adjusted the layout of descriptions and technical specifications, giving them a form of tables which are provided at the end of each product category. We invite you to study our offer for season 2018/2019. 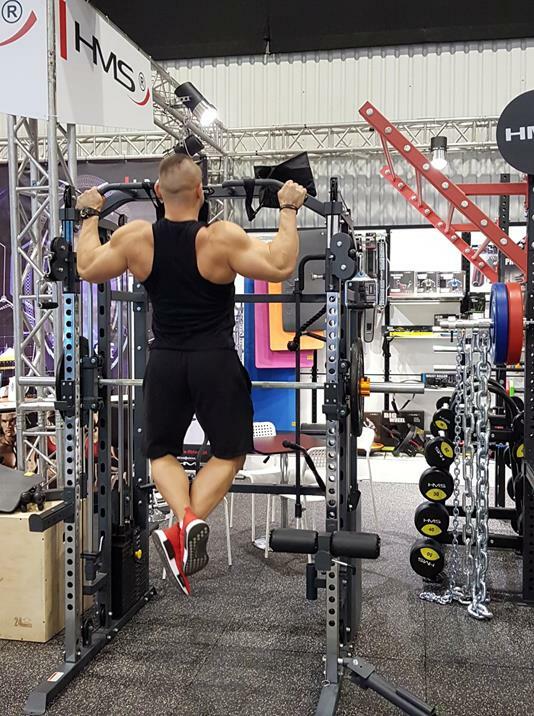 Our offer has been extended by two new Smith Press Machines – CYLOP 1 and CYKLOP 2. 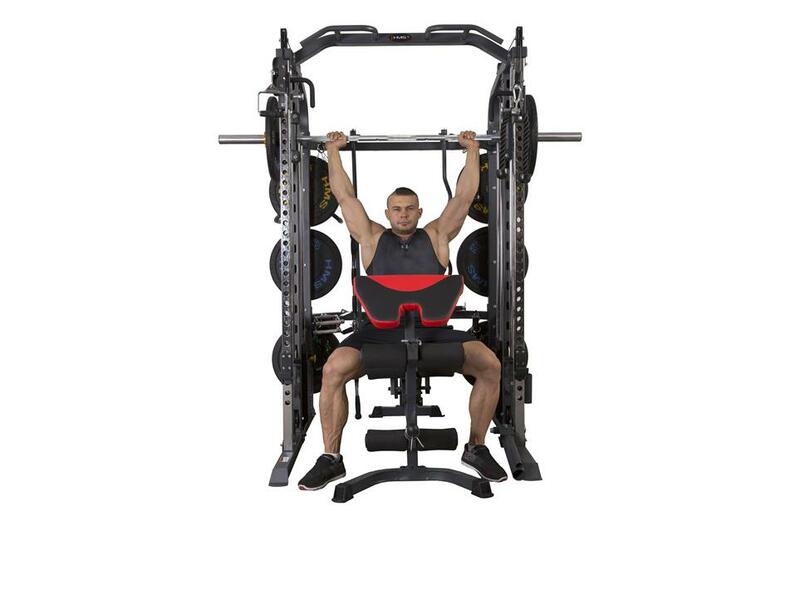 These Smith Press Machines are additionally equipped in two pulleys and grips for a free barbell. Such combination ensures 100% performance of workout of each muscle group. Our “CYKLOPS” are twin Smith Press Machines. The only difference between them is the loading of pulleys. CYKLOP 2 offers two weight stacks, 90 kg each, whereas the other machine provides space for loading plates. Each of these wonderful machines, along with the attached a set of accessories, will fulfil expectations of the most demanding users. 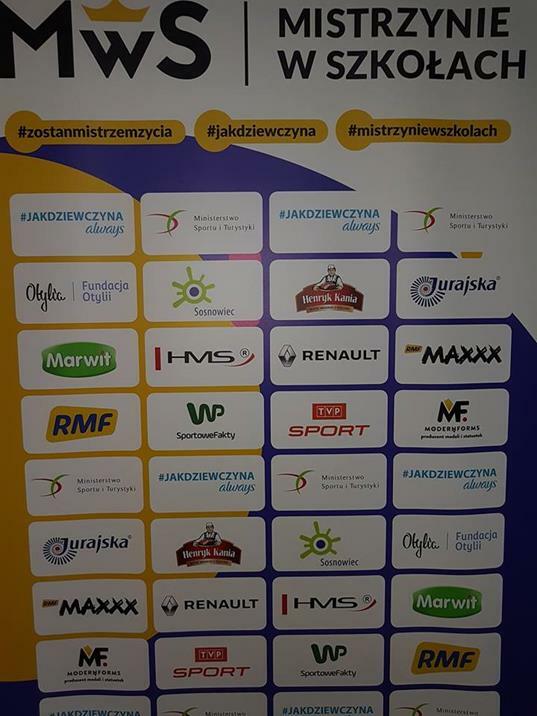 On May 15th, HMS supported the project of the Otylia Jędrzejczak Foundation titled “Mistrzynie w szkołach” in Grębocin. 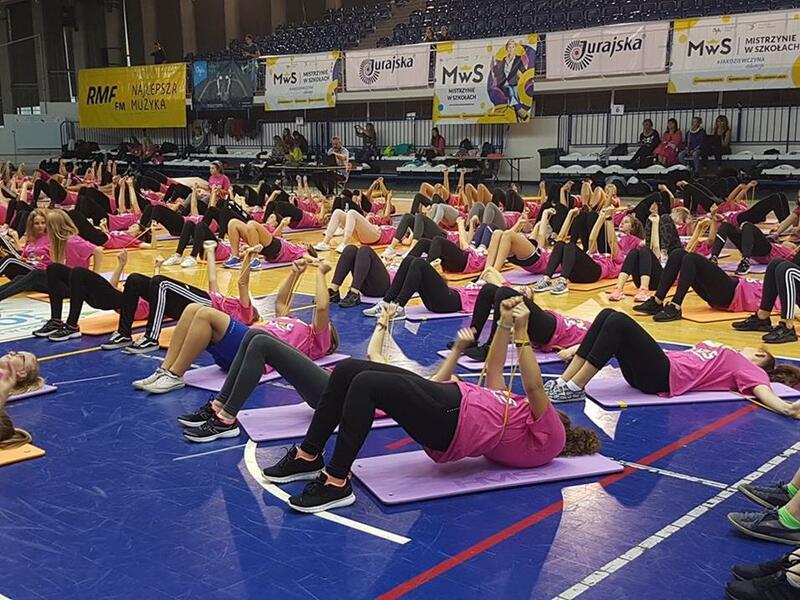 The project is intended to encourage young women from secondary schools to attend physical education classes, as well as to promote healthy lifestyle. During the event, nearly 400 female students trained with HMS bands. We are proud to have had a chance to participate such an ambitious project. We would like to invite you to our gallery of photos. 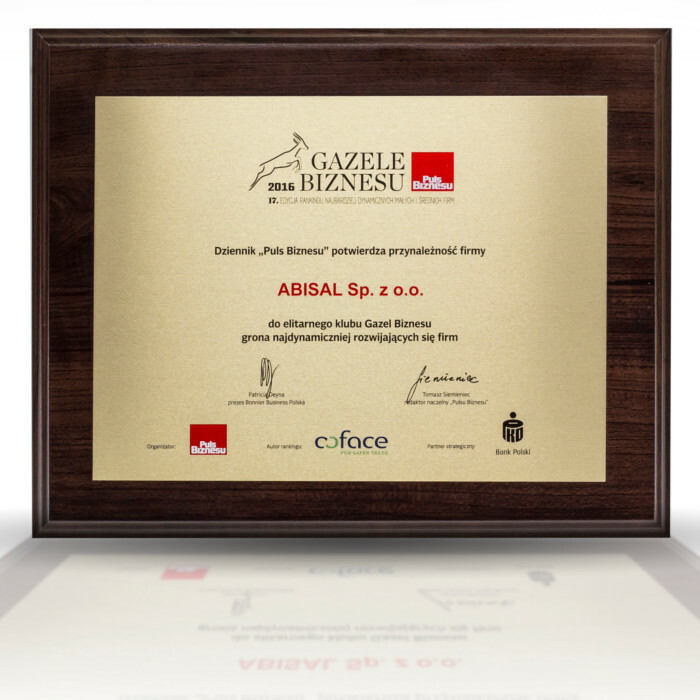 On 1st of March in Academy of Music in Katowice the Gazelle of Business awards were given for the most dynamic companies from the Silesian area. 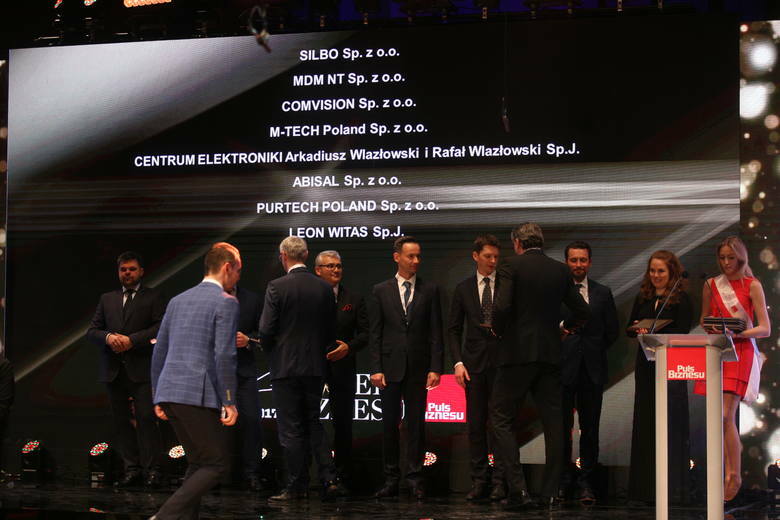 Seven companies from Bytom were granted with mentioned title for the most dynamically developing small and medium enterprises. Companies nominated for awards are subject to a detailed analysis of financial results, taking into account over eighty aspects of activity. Each company had to fulfill many operating conditions such as: increase in sales revenues year after year and no losses during this period, in the three previous years. 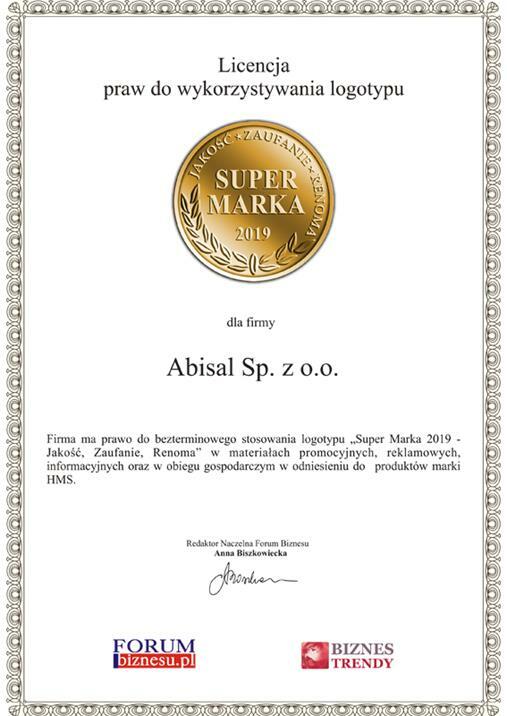 During the gala at the Karol Szymanowski Academy of Music in Katowice Abisal Ltd. was joined to the elite group of Gazelles of Business members. Achieving such a good position was possible thanks to the recorded by the company, in the period 2014-2016 revenue growth of over 204%. 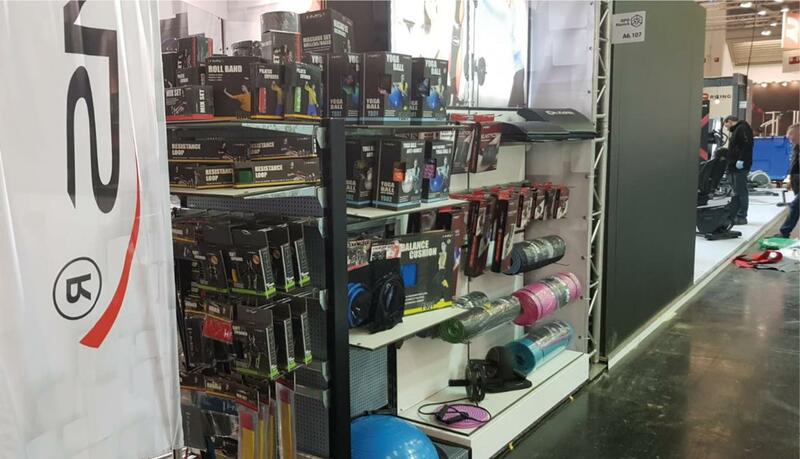 On Wednesday, the 31st of January, the ISPO Munich 2018, the most important sport-outdoor trade fair for the European section, was finished. More than 2700 companies presented their latest products for Autumn/Winter 2018/2019 in the exhibition space covering 16 halls. There were as many as 46 manufacturers from Poland among them. 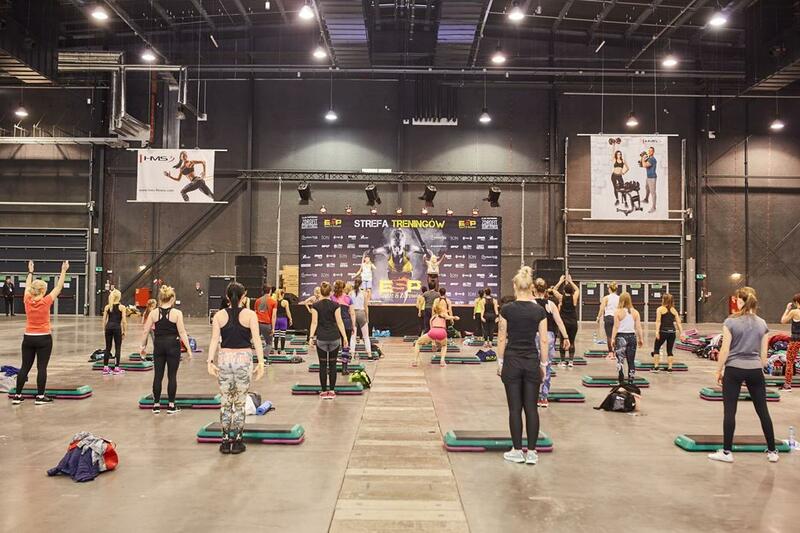 – press conferences, open meetings with representatives of the world of sport and sport-related business, lectures and seminars given by experts, fashion shows but also events in the city space under the ISPO Munich Sports Week took place almost on ongoing basis. HMS brand could be seen in hall A6, on a stand number 419 which covered surface area of 90 m². 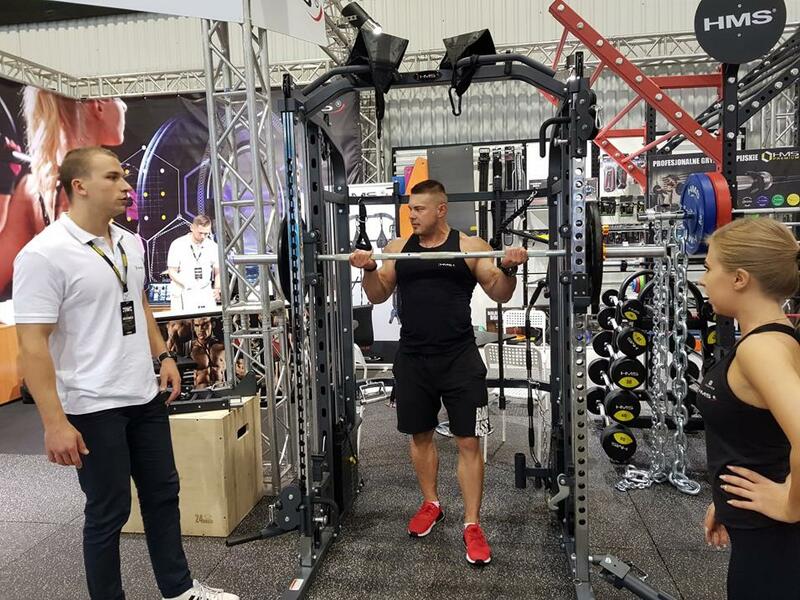 The trade fair visitors could see for themselves new products offered by the company in the fitness and body-building categories. 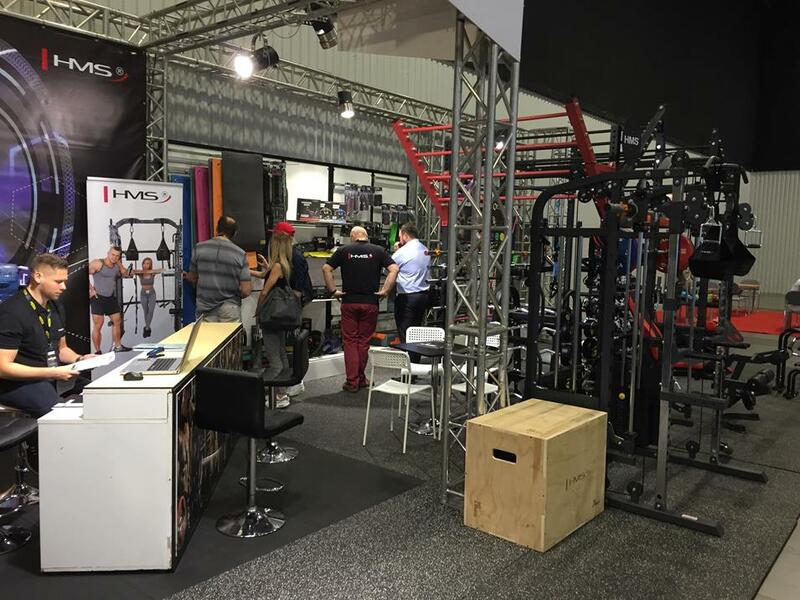 The stand showcased state-of-the-art treadmills, bicycles or elliptical machines, supported with applications available for mobile devices, as well as accessories necessary in each fitness club: bands, expanders, roll and rollers, balls, skipping ropes, and many others. 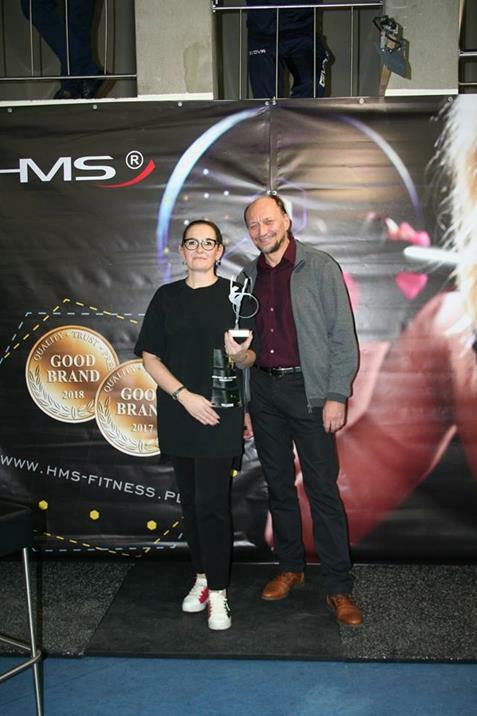 We are pleased to inform you, that our brand HMS received the title GOOD BRAND 2017/2018 – Quality, Trust, Renown in the category: accessories and fitness equipment. 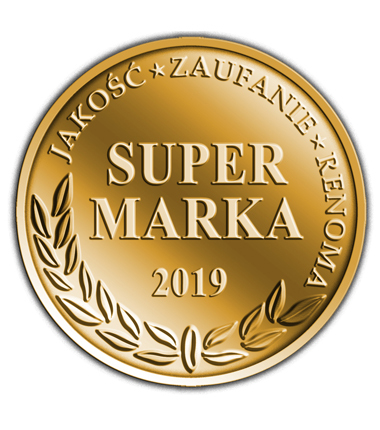 This distinction is given to the most developmental and recognizable brands, and that is why we are specially proud to be the one of the best on the market. 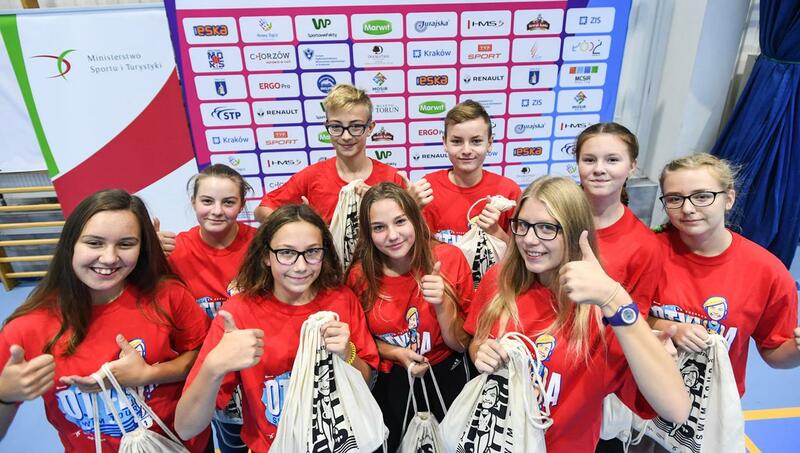 We invite you to the International SPORT LIFE Fair in Brno. ABISTORE will be one of the exhibitors of sports equipment. The event will take place on November 10-12, 2017. Address: Výstaviště 405/1, 603 00 Brno, Česká Republika. 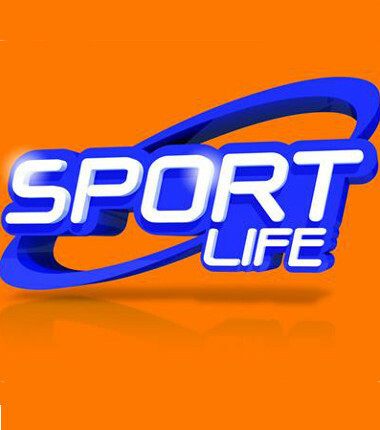 SPORT LIFE is one of the biggest event in Central Europe. 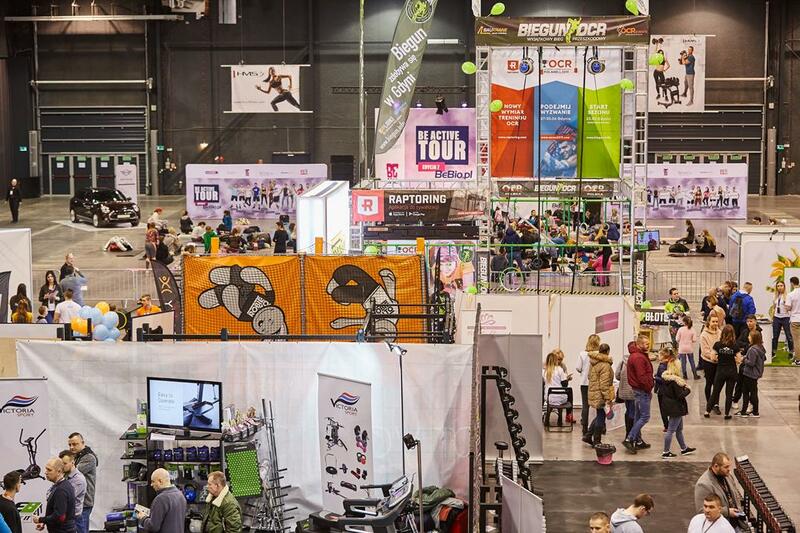 Dozens of exhibitors, presenting the latest trends in sports equipment and clothing. 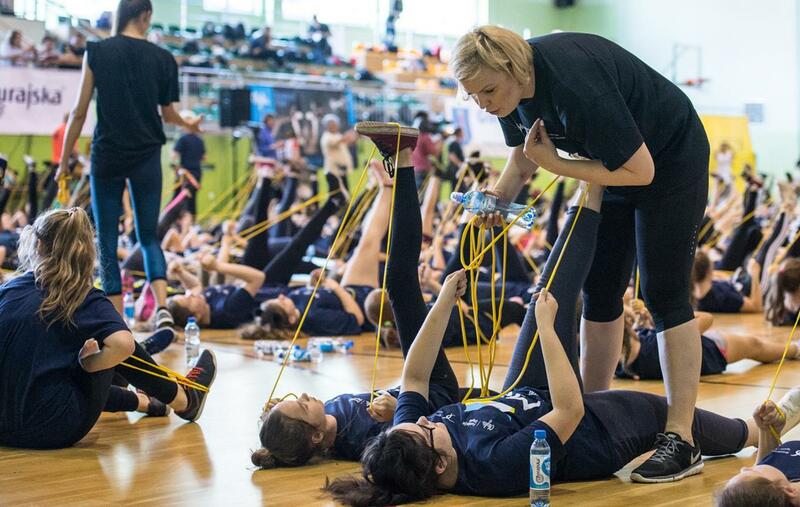 There is a long list of accompanying events: International Championships of the Czech Republic in Muay Thai, Freerun, Artistic Gymnastics, Biatlon with laser shooting range and many other events, that attract active lifestyle lovers to Brno. We invite you to the ABISTORE booth no. 021, where you will be able to see NEWS 2018 and also consult our experts! 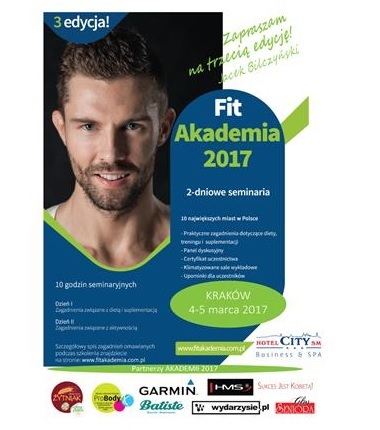 Spring brings us the Fit Academy by Jacek Bilczyński – it is a series of 11 meetings starting on the first weekend of March. It will take place in different Polish cities. 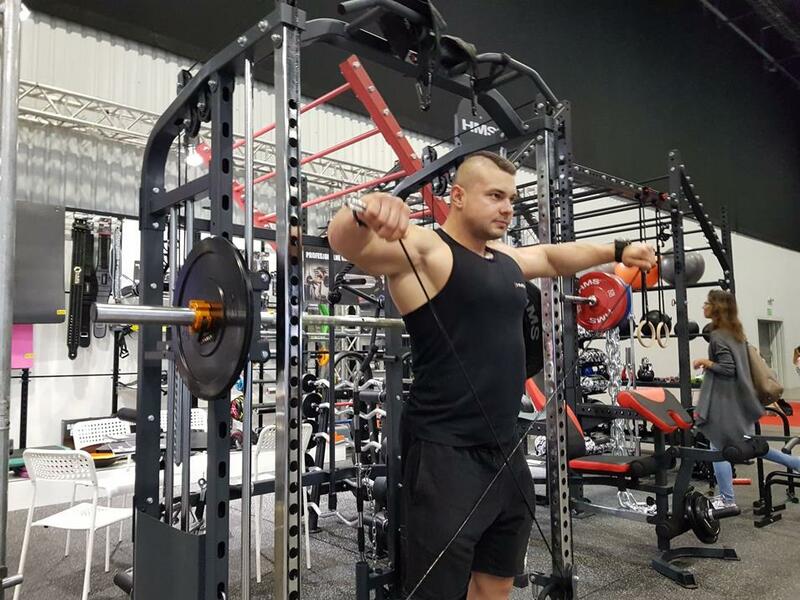 Jacek Bilczyński is one of the best and the most popular personal trainers in Poland. All the exercises will be presented on the HMS fitness equipment. 4 days, 2732 exhibitors from all over the world and 85 thousands of visitors from 120 countries. 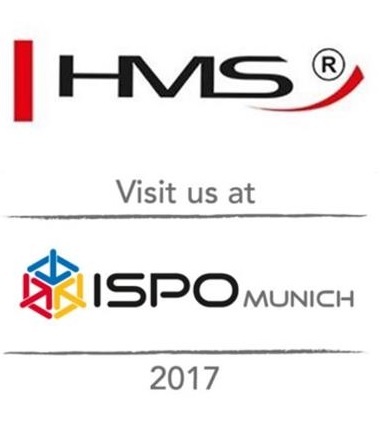 This is a summary of ISPO Munich 2017, international trade fair for sporting goods and sportswear. This year’s edition of the world’s largest event of this type attracted more visitors than ever. 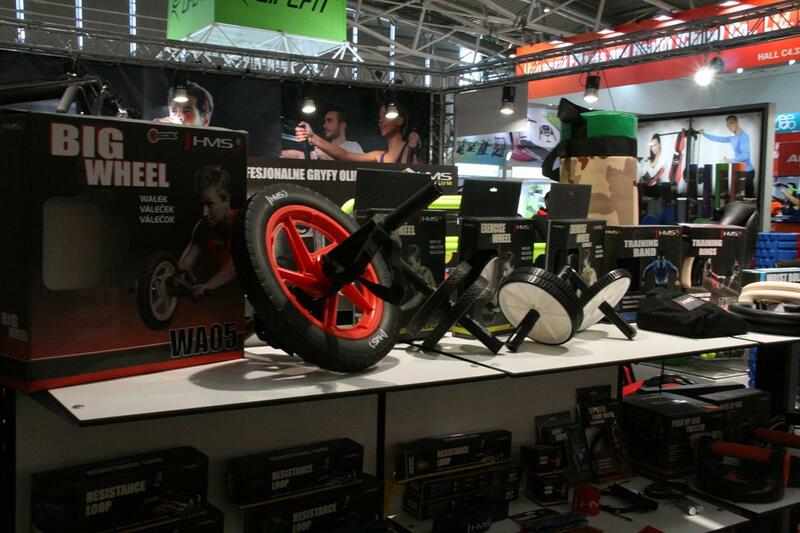 The exhibitors were presenting their products, novelties and innovations. There were many shows and specialists’ lectures during the fair. The positive atmosphere was clearly noticeable in the full halls. 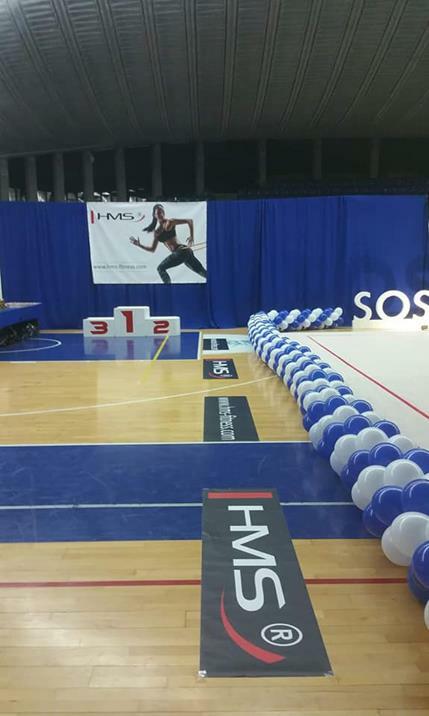 Once again HMS brand was a part of the biggest trade fair in sports industry in the world. 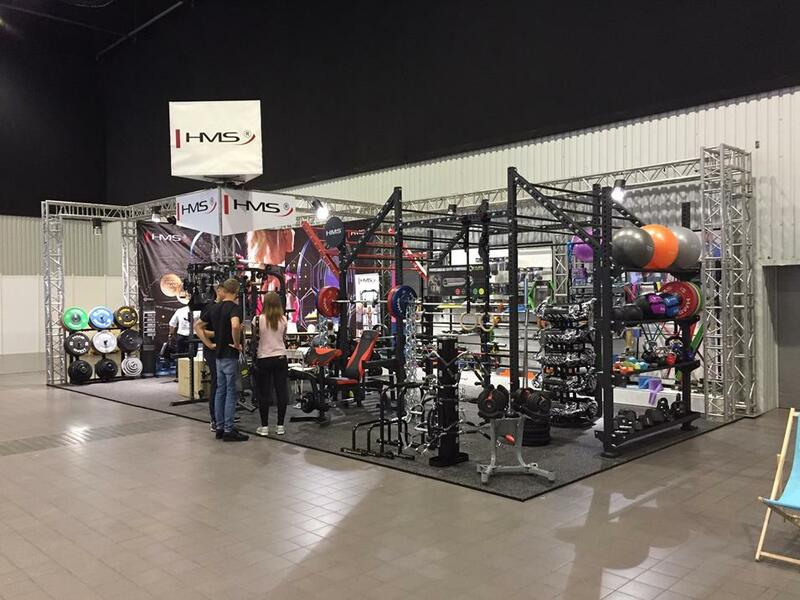 Our booth of nearly 70 square meters allowed us to present numerous products and accessories for fitness, weight lifting and others. All the visitors could check the possibilities of the presented items. 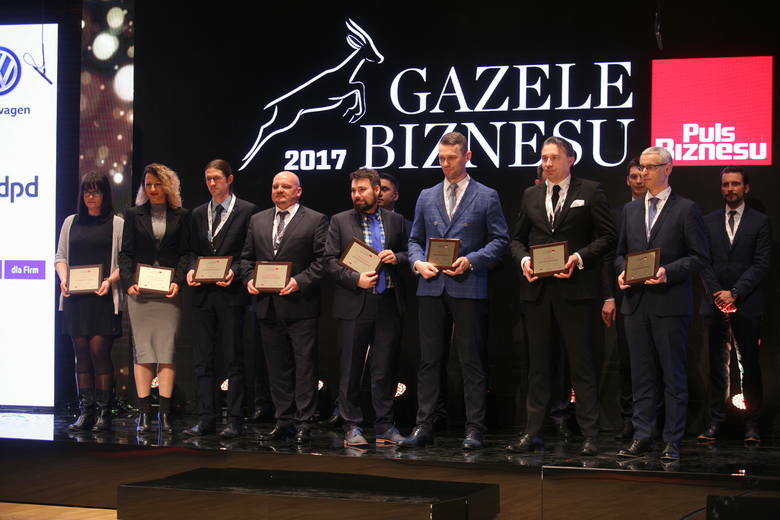 On 1 February in the Academy of Music in Katowice there was a prize-giving ceremony of Gazele Biznesu, the award for the most developing companies in Silesia. Abisal sp. z o.o. was one of the laureates. 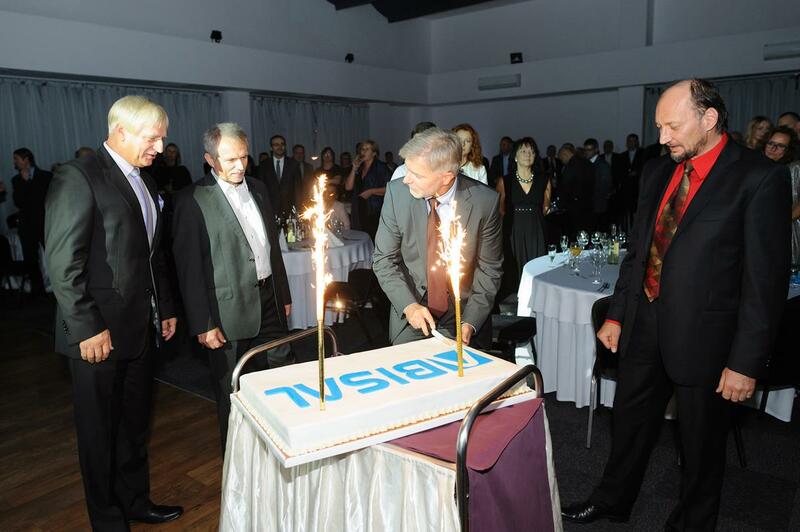 It ranked first among all the companies from Bytom and among all the companies from sports sector in Silesia. 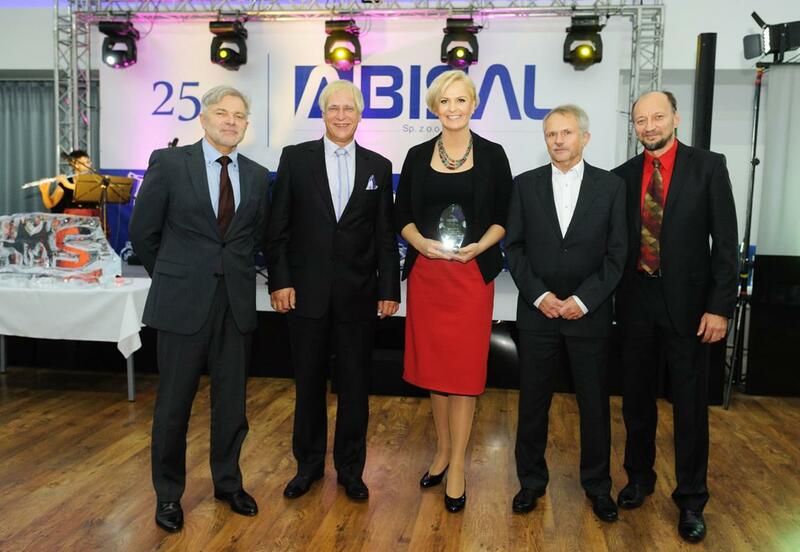 Gazele Biznesu is a ranking of the most developing small and medium companies. The financial results of all the nominated entities are analyzed and more than eighty aspects are taken into account. 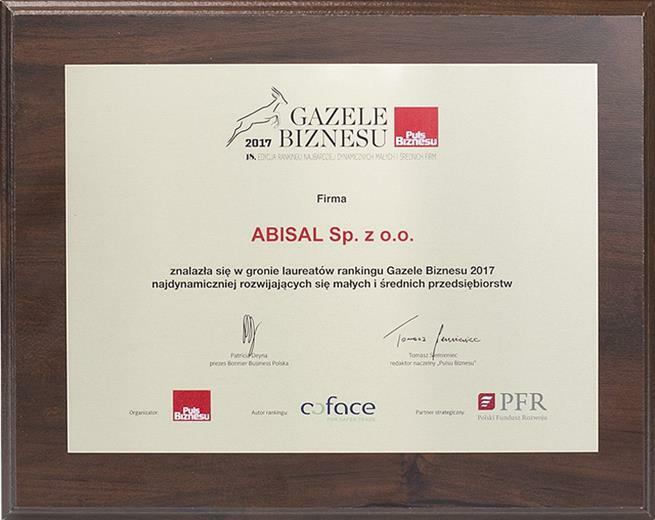 To get nominated for the title of Gazela Biznesu 2017 each company must comply with many conditions, such as recording the revenue growth in the last three years, with no single loss during this period. 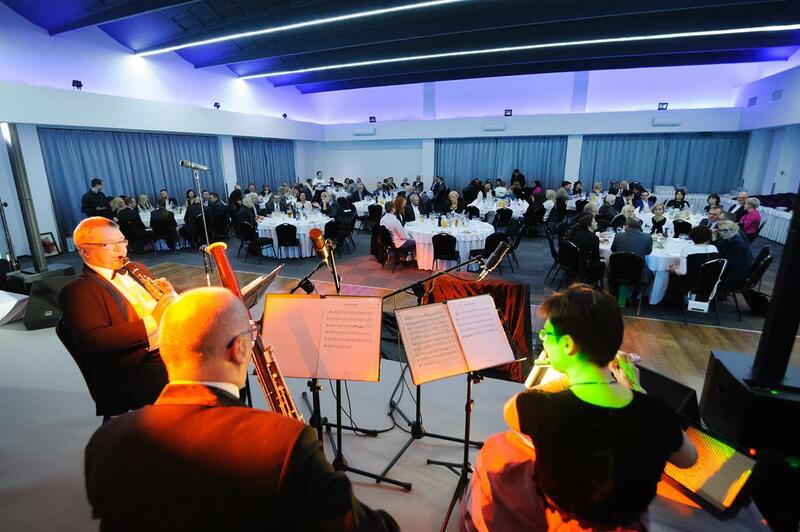 During the celebration in the Karol Szymanowski School of Music in Katowice Abisal sp. z o.o. joined the elite group of Gazele Biznesu winners. 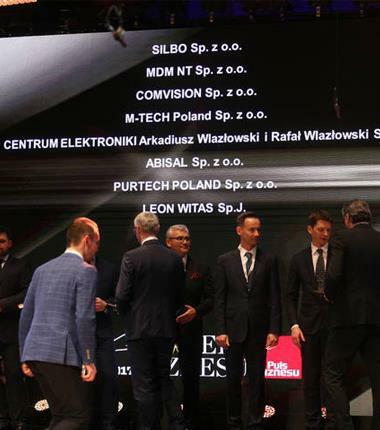 The first position among all the companies from Bytom and the first position among all the Silesian companies in sports sector is a great honor. It was possible thanks to the revenue growth of 156% in 2013-2015. Anna Ferdyn, Financial Director of Abisal sp. z o. o., represented the company during the award ceremony. 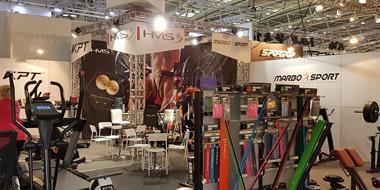 This year ISPO MUNICH edition will be held from February 5th – 8th. On this occasion, the Bavarian capital will be visited by tens of thousands of people, all interested in the sport industry. 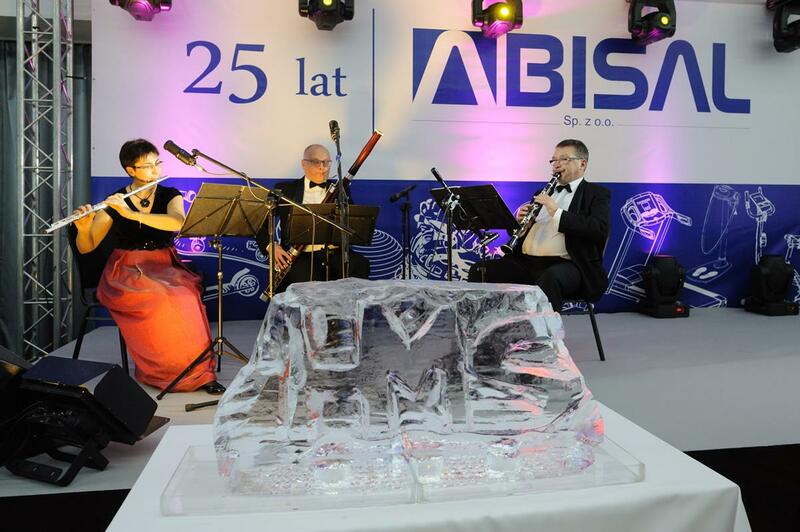 Among the exhibitors there will be also ABISAL with its brand HMS. ISPO trade fair has been held since 1970. It is the largest event of its kind in the world. In 2017 more than 80 thousand visitors are expected. There are 16 big exhibition halls where you can find more than 2700 exhibitors presenting their products – which is an absolute record in the history of Munich fair. There is always a chance to learn from the professionals during hundreds of presentations and lectures that will be performed during ISPO. 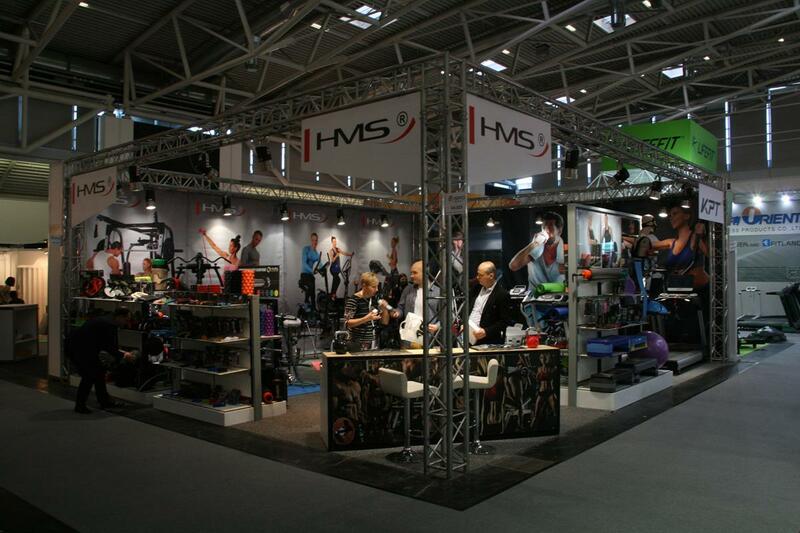 HMS brand visited ISPO show many times before and the same will happen this year. 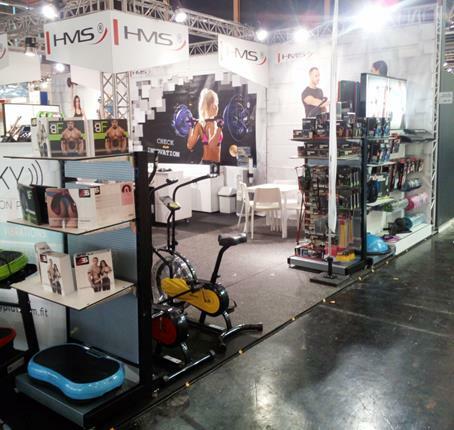 Almost 70m2 booth allows to present wide range of products for fitness and body building. Visitors can try all the equipments themselves: treadmills, exercise bikes, cross trainers and also some fitness accessories. This year we have introduced to our offer a new generation of bikes and elliptical bikes. Their braking system is controlled by electromagnet. This type of equipment has higher level of technological development. In traditional bikes and elliptical bikes the resistance is reached by a fraction of the flywheel. In magnetic bikes and elliptical bikes it is achieved by changing the intensity of magnetic field created by electromagnet. The resistance force is set electronically by a microprocessor. It is controlled by electric motor. It gives the possibility to set its value with great precision. The greatest advantage if this system is bigger fluidity of changing the resistance level. Reducing and increasing its scale, as well as the perception of above mentioned, occur in short period of time. And that’s not all! Magnetic bikes and elliptical bikes have a possibility to set higher level of resistance than the models with mechanical technology. It allows to offer bigger number of training programs and functions. At the same time the device is very silent so the training don’t disturb the people that are around you. 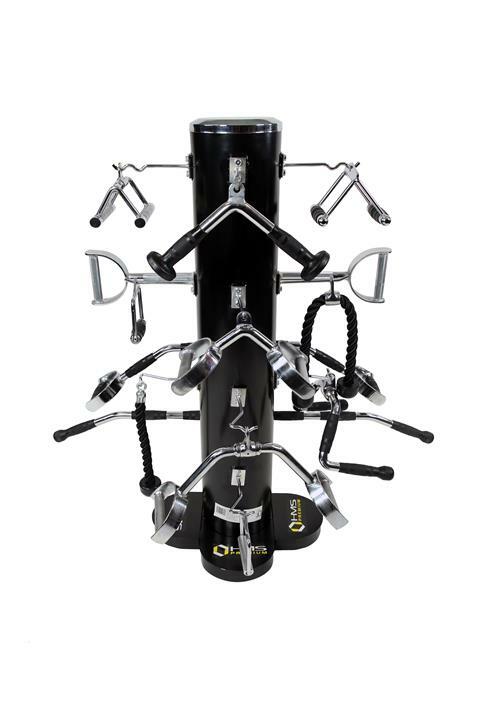 When choosing the magnetic equipment we receive a high-tech device that offers a wide range of exercises. Each user can personalize it according to their preferences or level of professionalism. 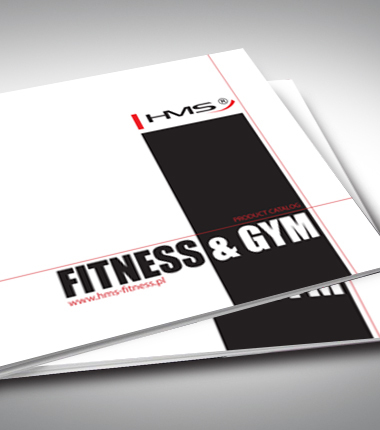 We are proud to present you a New Catalogue of HMS brand. It is our offer for the season 2016/2017. It has an interesting graphic design and it contains nice photos of bikes, elliptical bikes, treadmills, home gyms, jump ropes, grips, rollers and many others. When comparing to the catalogue from last year, it has extended by almost twenty pages. This is the effect of introducing new products to our offer. We encourage you to check our new bikes and elliptical bikes. For the first time we offer you the products with Semi Commercial mark. This mark means that the equipment is perfect for commercial use in small fitness clubs, spas and wellness centers. We have also extended our fitness offer of the equipment (bikes, treadmills, elliptical bikes) that operates mobile devices. Thanks to dedicated applications and Google Street View Maps an everyday training may change into virtual trip to any place in the world. The users have an access to the information about their trainings. It helps to make analysis of historical data and current activities. But this is not the end! 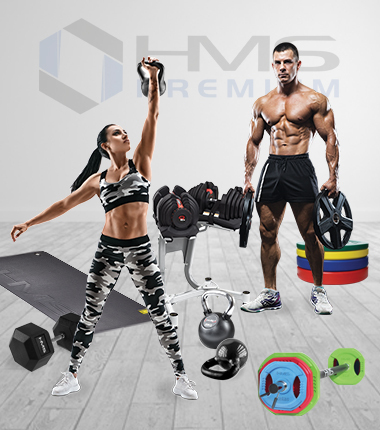 Now you can also find in our offer a new equipment with HMS Premium brand. We introduced it to the market in 2014. It is addressed to the most demanding customers. It was created because of our passion for high quality materials, durable constructions and verified technical solutions. All these elements are the base of HMS Premium line. That is why this brand guarantees unforgettable experience and great satisfaction from trainings. We would like to point out that our offer of bars and weights is being extended all the time as well. There are new kinds of products. 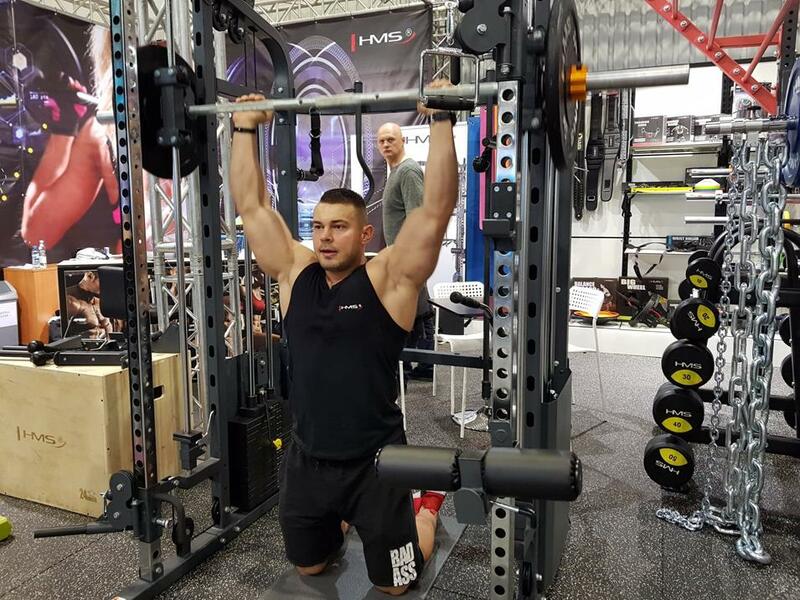 You can find there new kinds and types of olimpic bars, barbells and plates. 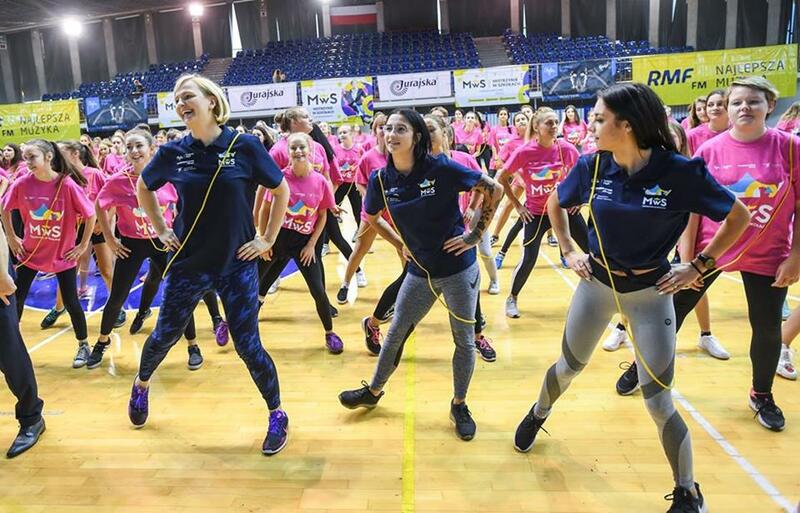 On Oct. 9, 2016 in Warsaw begins the biggest fitness trade event in Central and Eastern Europe – the International Fitness & Wellness Fair (FIWE). We will use this opportunity to present the newest products in the HMS product line. 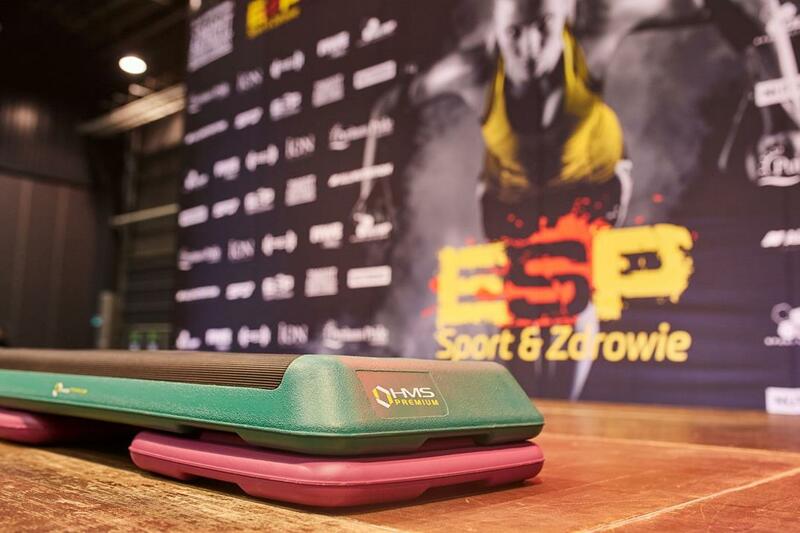 The fair will be taking place in the EXPO XXI center in Warsaw. We encourage you to visit our booth! 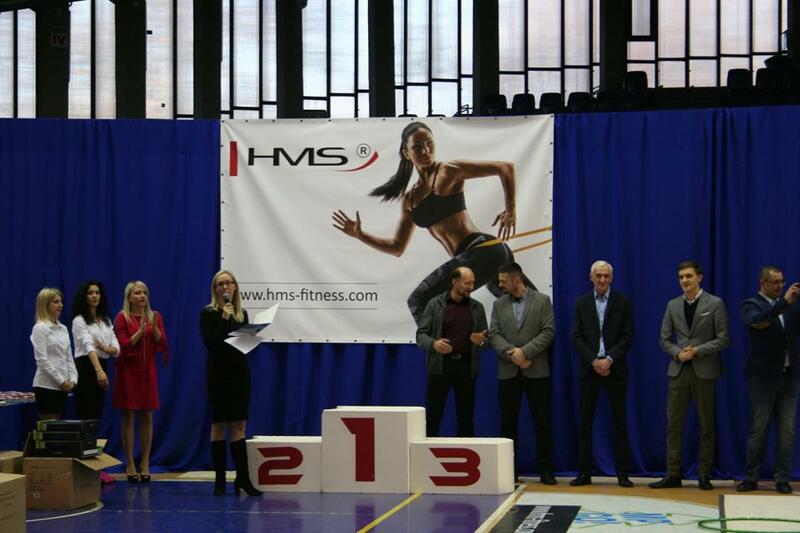 The International Fitness & Wellness Fair is the most prestigious trade event in Poland to date. With its businesslike character it aims at presenting a broad range of equipment, accessories and services in the fitness & wellness sector. 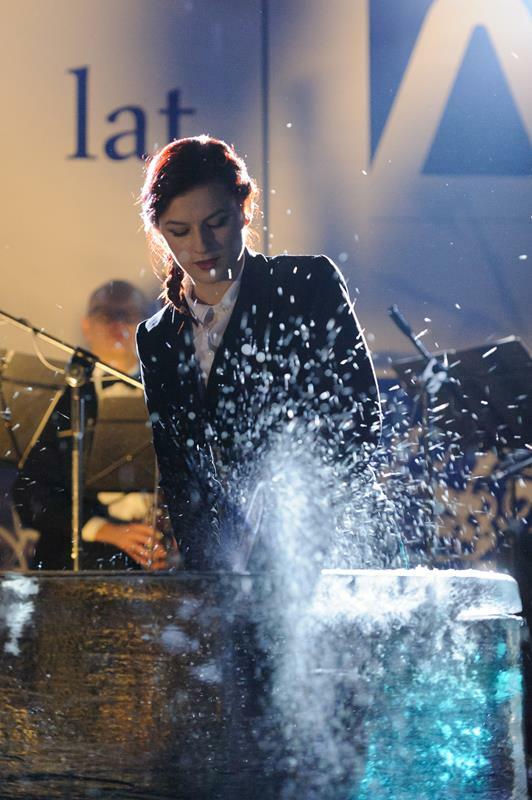 The event will be complemented with unique performances by special guests – Natalia Gacka, Michał Karmowski, Steve Feinberg, Akop Szostak, Łukasz Kazimierczak, Jacek Bilczyński and Mariusz Mróz. In addition, FIWE CROSS CHAMPION will be held as a special event during the fair. 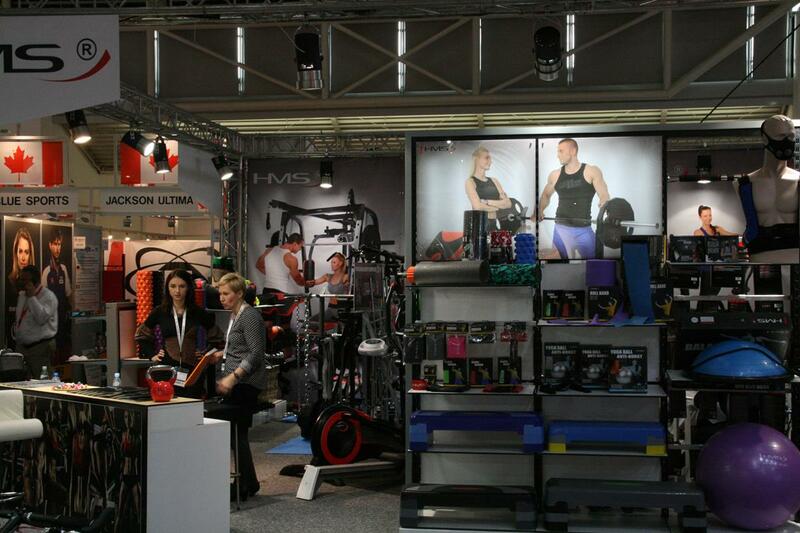 During this year’s edition of FIWE visitors will be able to explore a wide selection of HMS fitness equipment. 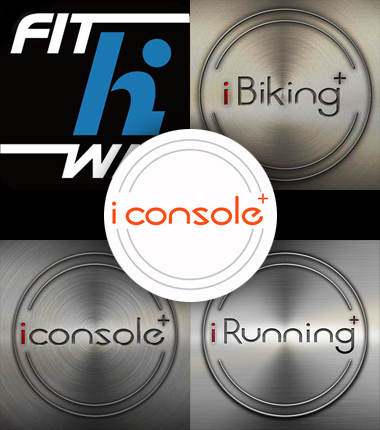 Among others, we will present our latest exercise and elliptical bikes: H1708-i, H1833-i, M1844-i and R1817. 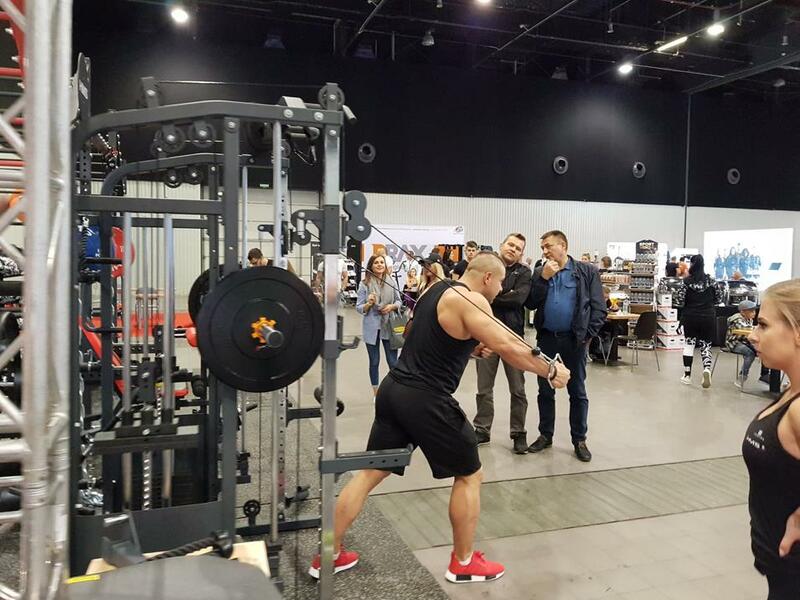 Our guests will also have an occasion to discover a wide variety of weight lifting bars, dumbbells and weights, including the Olympic bar GO680 HMS and Olympic plates. Last but not least, we will also be presenting our new foam rollers FS104 HMS, FS107 HMS & FS109 HMS and fitness sets TX-PRO HMS i TX10 HMS. All of this and more can be found at our booth! 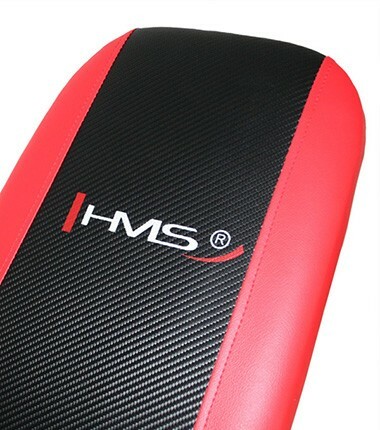 Foam rollers FS104, FS107, FS109 are our novelty items that complement the already rich selection of rollers in the HMS product line – a collection of equipment and accessories designed for a complete workout, therapy and rehabilitation. Every item has been made of high quality materials, which guarantees comfort of use. EVA foam is abrasion-resistant and does not absorb moisture, making the product very easy to keep clean. The roller will not only help improve the physical condition, but will also tone the body effectively. Due to its massage function it will be an excellent choice for those wanting to enhance blood circulation. 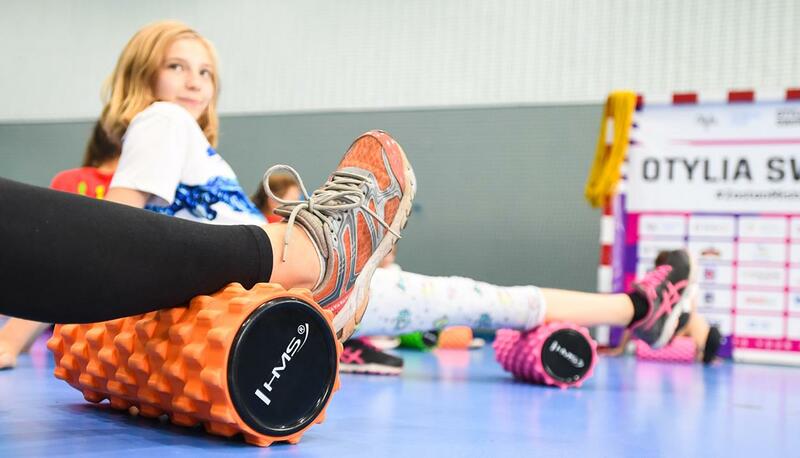 A workout with a roller activates and strengthens postural muscles, which in effect improves the overall endurance and mildly corrects postural faults. The exercises will enhance your joint mobility, flexibility and agility. 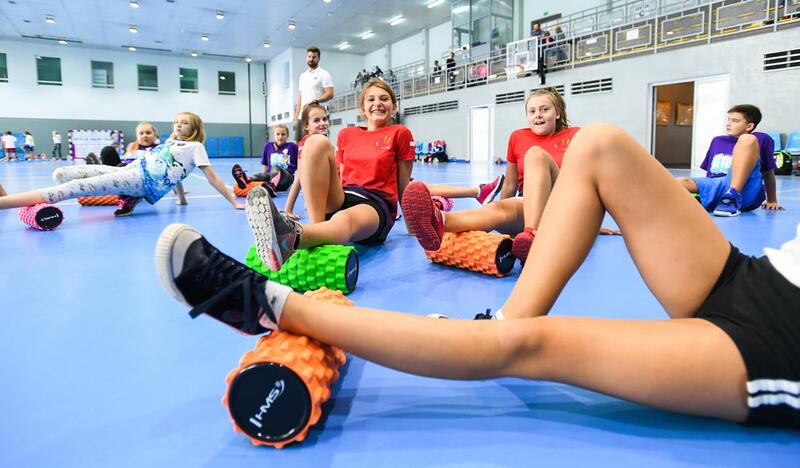 Foam rollers are increasing in popularity as they help eliminate hardening of connective tissue. Consequently, muscle tension is reduced allowing full fascial relaxation and thus creating optimal conditions for an effective regeneration process. Advancing of these regeneration processes whilst maintaining maximum effectiveness translates directly into your results. It is in fact a domino effect, as you will be able to develop faster, increase your endurance and prepare yourself for more demanding workouts. 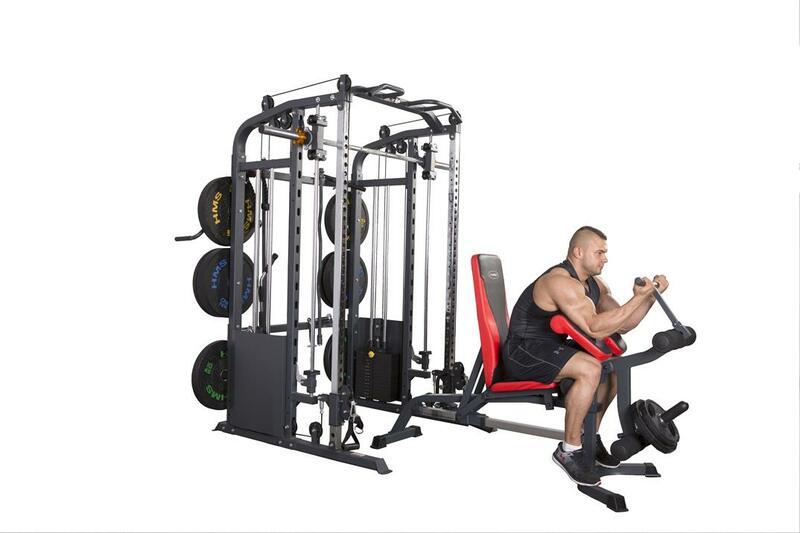 For everyone looking for versatile fitness equipment to increase muscle definition and physical strength, we have introduced a brand new weight lifting bench LS3859 with a maximum weight of 270 kg. The bench offers a sufficient level of exercise variety for both lower and upper body parts. You can train all muscle groups: the chest, arms, legs and thighs. 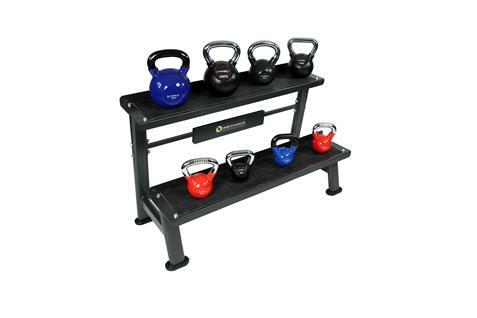 LS3859 HMS consists of two independent parts: a bench and a barbell stand. 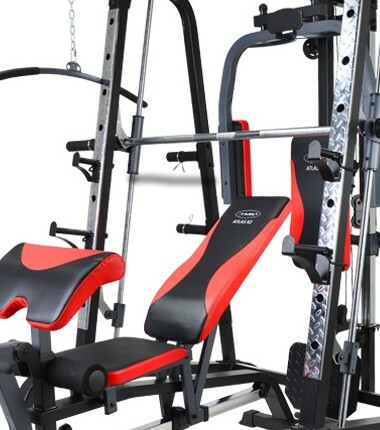 The equipment is fully configurable – from the height of bar to a 6-position adjustable backrest, and a detachable preacher curl attachment – designed to meet your workout needs. LS3859 HMS is made of high quality materials, which guarantees a high level of stability and safety of use. Durable EVA foam has been used for your comfort and carbon-style upholstery provides a modern touch with enhanced durability. The Olympic bar GO680 HMS is made of hardened chrome steel. It is a perfect combination of high durability with an ideal level of flexibility. It is fitted with a precisely knurled, firm and comfortable grip, and comes with two plastic collars. The barbell allows for a maximum load of 680 kg. 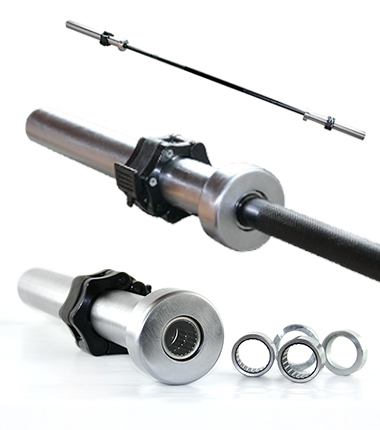 The shaft with a 28 mm diameter offers high durability without any loss of comfort for the user. The process of chrome plating ensures that the bar will maintain its original appearance over a very long period of time and is the best method of rust prevention. GO680 HMS is fitted with 8 needle bearings in order to provide smooth rotation of sleeves. Despite their moderate diameter, needle bearings provide a high level of stiffness and dynamic capacity. The construction of the bar ensures that the tension between its moving parts is eliminated, which in consequence results in an increased lifespan of bearings. As a high quality piece, the bar will be a good investment for many years. 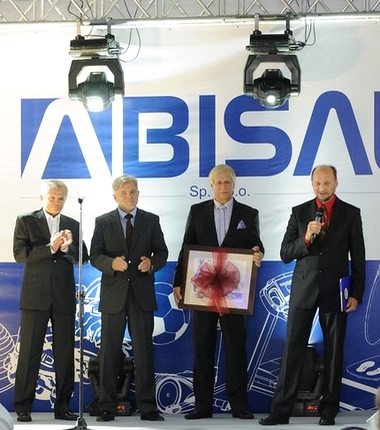 120 guests including business partners from Poland and abroad, customers, representatives of authorities, the Board and employees of Abisal took part in the celebrations. 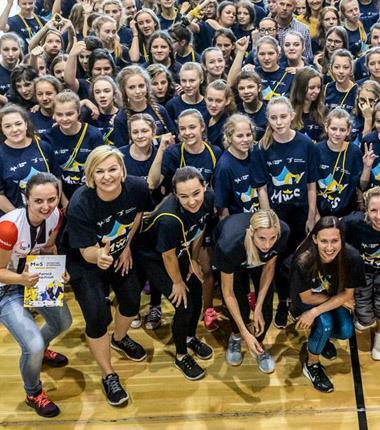 Our special guest was Ms. Otylia Jędrzejczak, whom we had supported at the early stages of her career in sport. We would like to thank each and every guest for being there and sharing those happy moments with us. The official part of the evening started with a summary of the most important events in the history of the company and HMS brand. 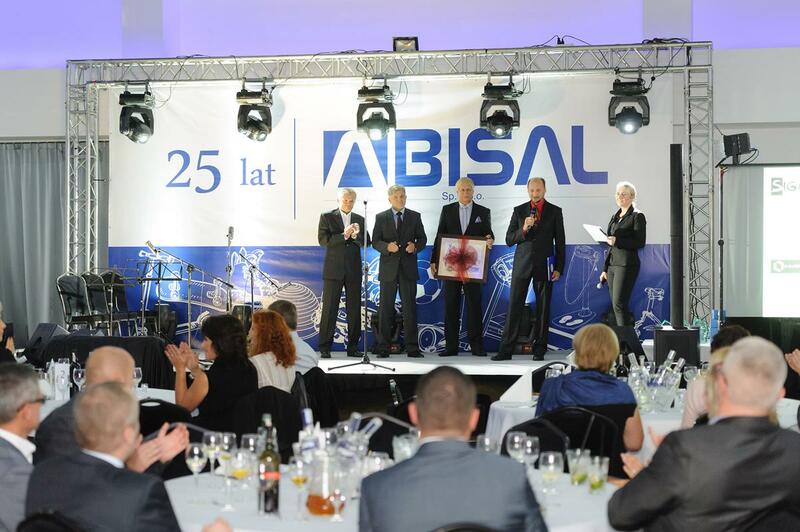 Members of the Board held a speech – Mr. Julian Łaba thanked the guests for their trust and partnership in business, while Mr. Ryszard Ziomek talked about Abisal’s values and principles, and about the friendship that had been the cornerstone of the company. 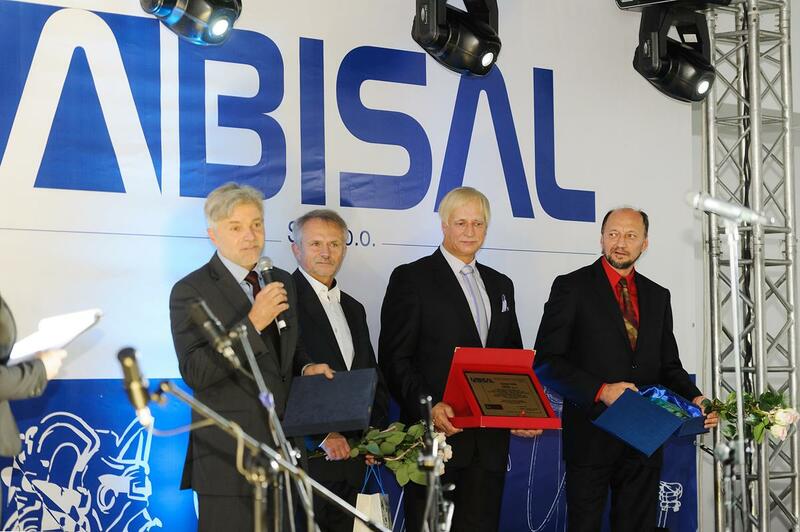 Later, representatives of companies who contributed the most to the success and development of Abisal appeared on stage to collect special anniversary statuettes and acknowledgements for their cooperation. 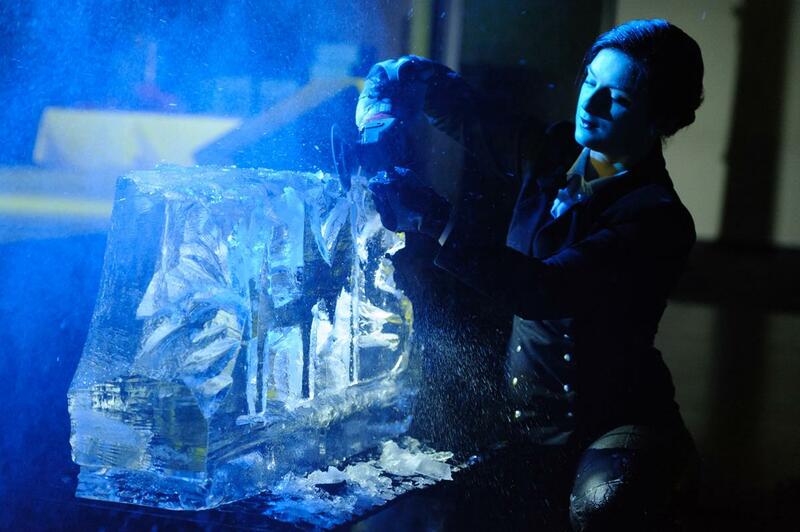 The highlight of the event was a cake cutting ceremony by all four owners and founders of Abisal, and a special performance by an ice sculpting artist. The evening was accompanied with the calming music of the Todo Art Trio band. 2015 marks itself as the 15th anniversary of HMS brand. We would like to thank all our customers and end users of our fitness equipment for the time you have spent with us and for the trust you have given us. It was a challenging time full of changes, from which we have gained a lot of valuable experience and inspirations for the future. Our mission from the very beginning was to deliver high quality fitness equipment that would meet all of our customers’ requirements. Through the years we tried to live up to it not only by taking care about the quality of the workmanship, but also about the technological innovations implemented in our products. A real breakthrough came with the next-generation products, which have been equipped with the latest technology supporting mobile devices with Android and iOS, and thus enabling the user to access an interactive information and entertainment center. Once more thank you for your constant support and the inspiration we have derived from your commitment. We are sincerely hoping for your contribution to a further development of the HMS brand. 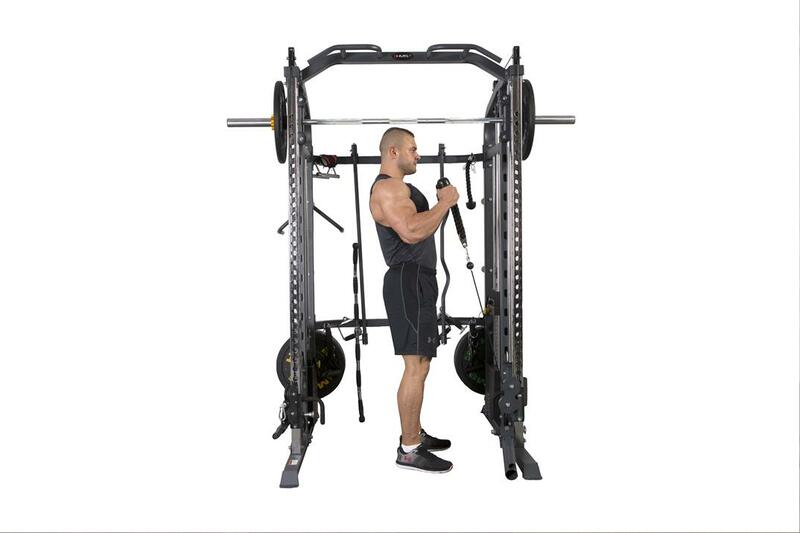 The Smith Machine is a simple, yet revolutionary piece of equipment used in weight training. 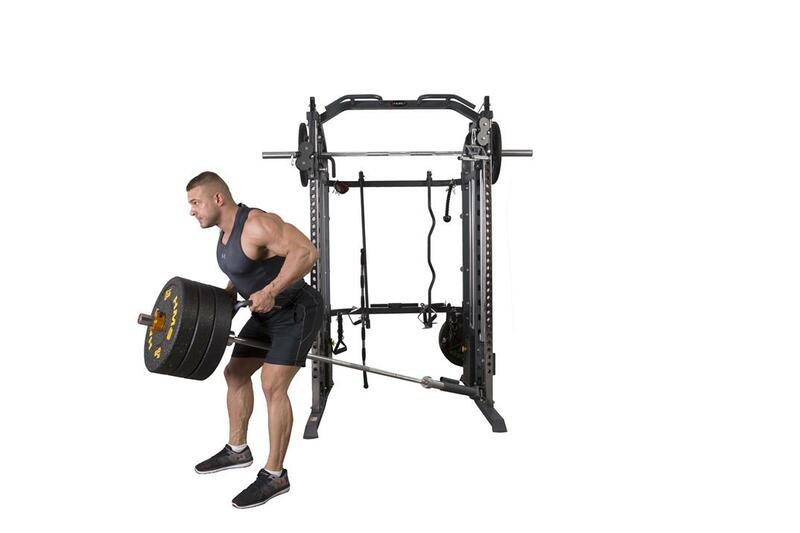 If you are looking for multipurpose fitness equipment to develop muscle definition and strength, you will be delighted to find 2 interesting Smith Machines in our collection for season 2015/2016. The machine allows you to do a much more diverse fitness routine compared to a classic home gym. 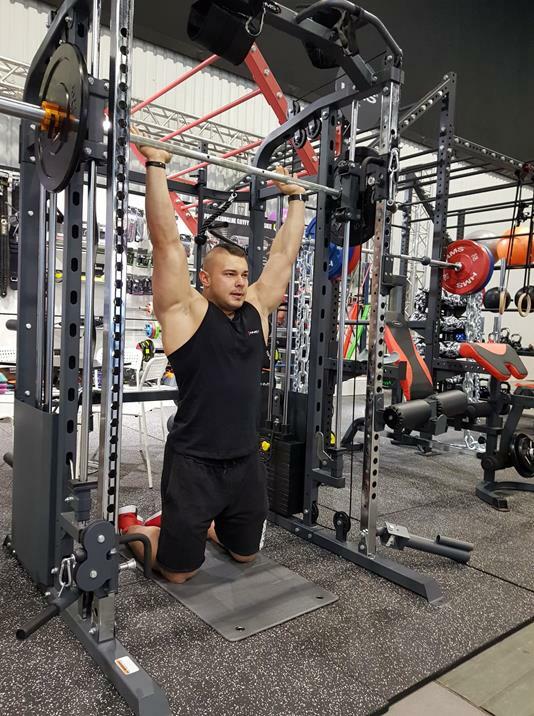 As the barbell is fixed within steel rails and can be hooked on any of the equipment’s safety slots, you can do your lifts in the comfort of your own home safely and without a spotter. The construction enables a smooth and stable vertical movement regardless of whether you stand, sit or lie down. CrossFit is a popular fitness regimen considered to be both a strength and conditioning program. Its universal formula – suitable for most ages and experience levels – combined with good results has won many enthusiasts in a short time. We are in! 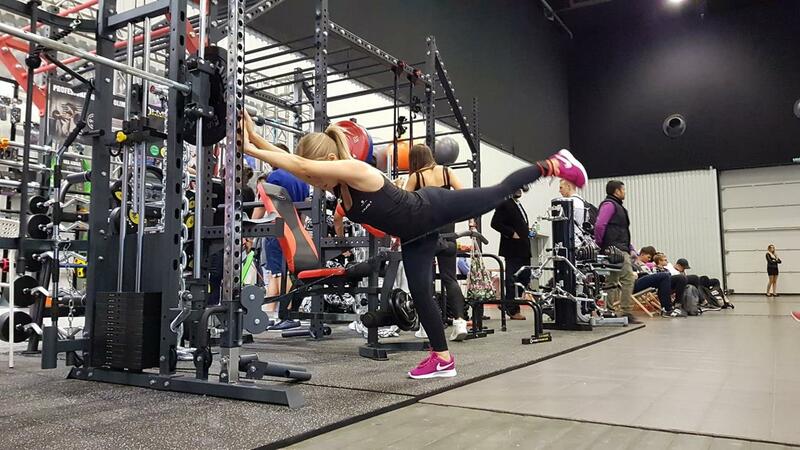 For this reason, we have extended our collection of products designed for CrossFit, aiming at increasing the versatility and intensity levels of training. Their construction and materials used provide almost infinite training options in all conditions. We encourage you to check this new product line for season 2015/2016, hoping that it will serve as a source of inspiration and new ideas for your training program. The most important features of fitness equipment are durability and safety. We shouldn’t, however, forget about the look, which significantly influences the perceived quality of the product. This had inspired us to search for materials meeting all of the criteria. As a result, our assortment underwent total metamorphosis. 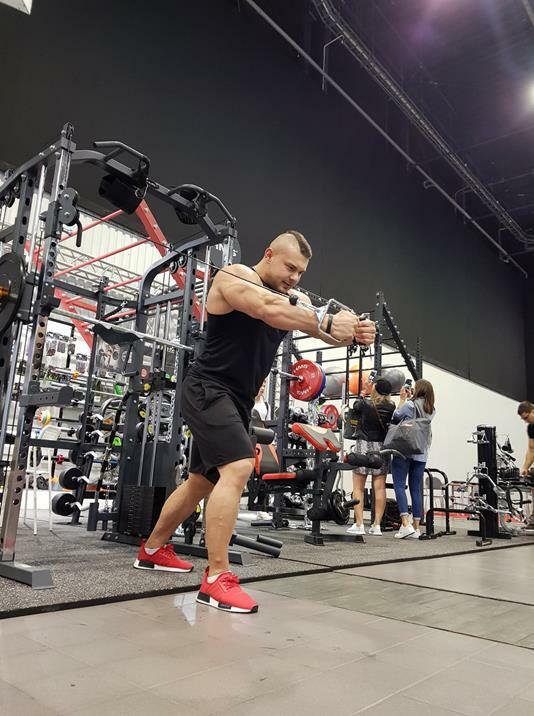 Starting from the current selling season, our entire strength training equipment – home gyms, Smith Machines and weight lifting benches – has been covered with new upholstery. Due to its modern design that resembles the structure of carbon fiber, every home fitness room will now gain a truly professional look. Quality-wise, it offers higher durability and functionality, making your training a more comfortable and safer experience. We hope that the changes we have implemented will meet your expectations and win your recognition. We encourage you to check our full offer. 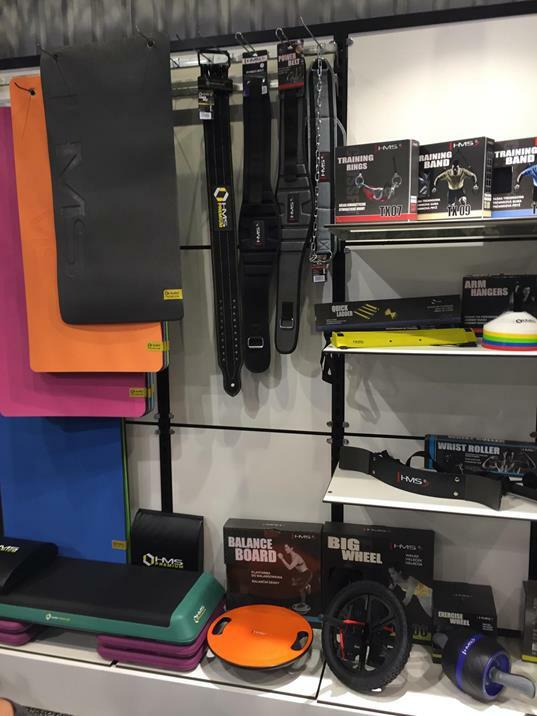 Season 2015/2016 comes with a complete change of the look of our fitness accessories. All products now have a new packaging, made of thick cardboard, thus obtaining higher durability and stylish appearance. Additionally, we have used unified packaging styles for particular assortment groups, which significantly improves the distinctness of the entire collection. The new packaging is distinguishable and neat. It enables you to see the product without opening the package. What’s more, every product is now marked with a different color according to its category. We have also enriched the information printed on the package – it now includes illustrations showing exemplary exercises which you can do with each product. All changes have been made aiming at creating a positive impression and comfort of use. We hope that they will meet your expectations. Here it is! 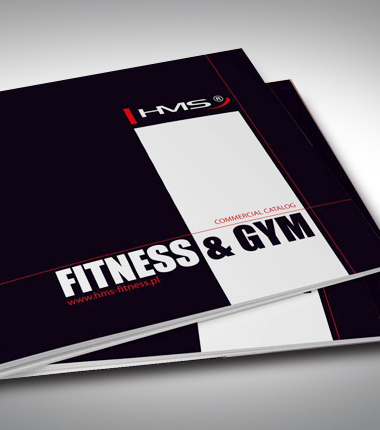 We are glad to present our new HMS catalogue for season 2015/2016. This time we want to inspire you with new technologies and encourage you to undertake physical activity in any form. Compared to last year, our catalogue underwent true metamorphosis. At first you will notice that its volume has increased – it is a consequence of the changes in our assortment range. Next, we have rearranged the way in which technical data is presented; now you can easily compare all the information in transparent summary charts. Additionally, we have used unified coloring for particular assortment groups which significantly improved the comprehensibility of the catalogue. 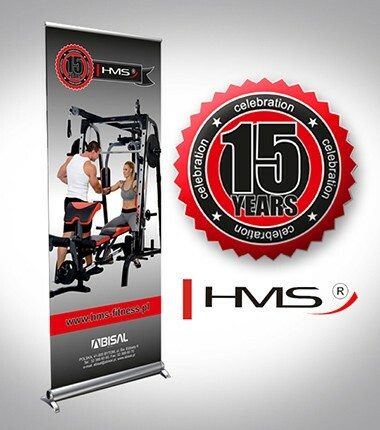 The new collection is special not only because it is our anniversary edition (15 years since HMS brand was created), but most of all because it introduces next-generation fitness equipment, such as exercise bikes, treadmills and elliptical trainers, which can be connected to most mobile devices. 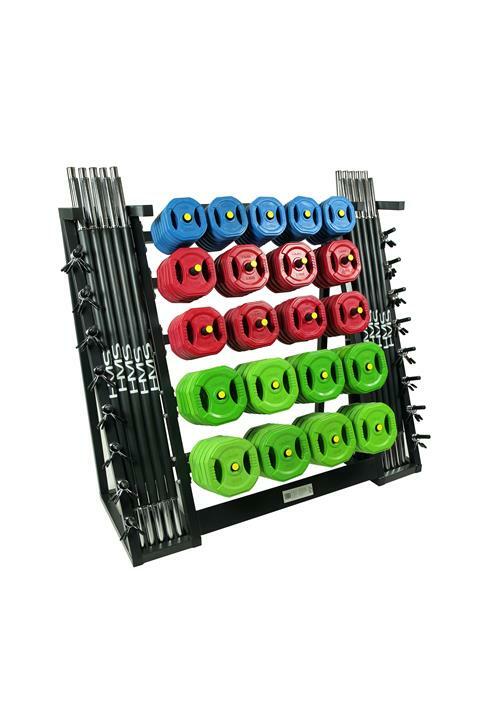 We would also like to draw your attention to the HMS Premium series, CrossFit accessories and Smith Machines. 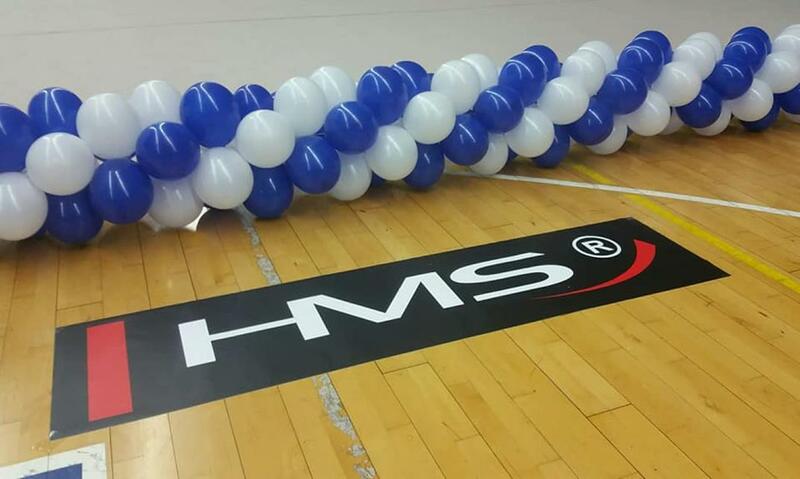 We encourage you to check our entire product line for season 2015/2016 in the hope that it will become a source of new possibilities and inspiration for your further cooperation with the HMS brand. Exercise and travel the world with our next-generation products! 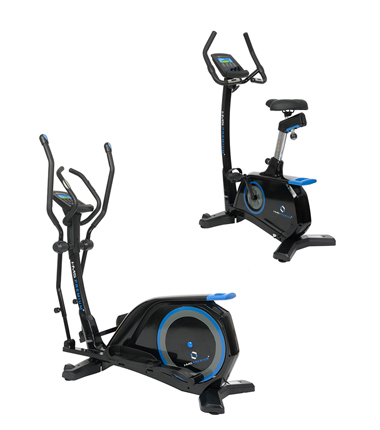 In the search for new and inspiring forms of training, we have equipped some of our exercise bikes, elliptical trainers and treadmills with the newest system to connect with your mobile device. Download a dedicated application integrated with Google Street View and your daily workout will never be the same again! Our equipment supports mobile devices with Android and iOS, offering a simple interface and intuitive operation. The possibilities are not limited to Google maps only – your mobile device can turn into an information center collecting data about your trainings and providing real-time control. 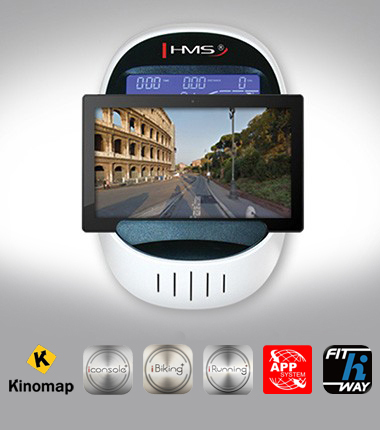 It is the perfect solution for everyone looking for a convenient way to keep track of the workouts. Click here for more information. We encourage you to check our full offer.